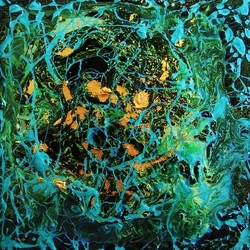 Welcome to my painting a day Gallery-Store. 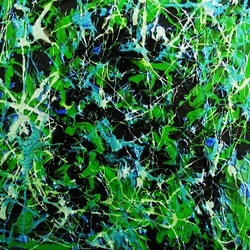 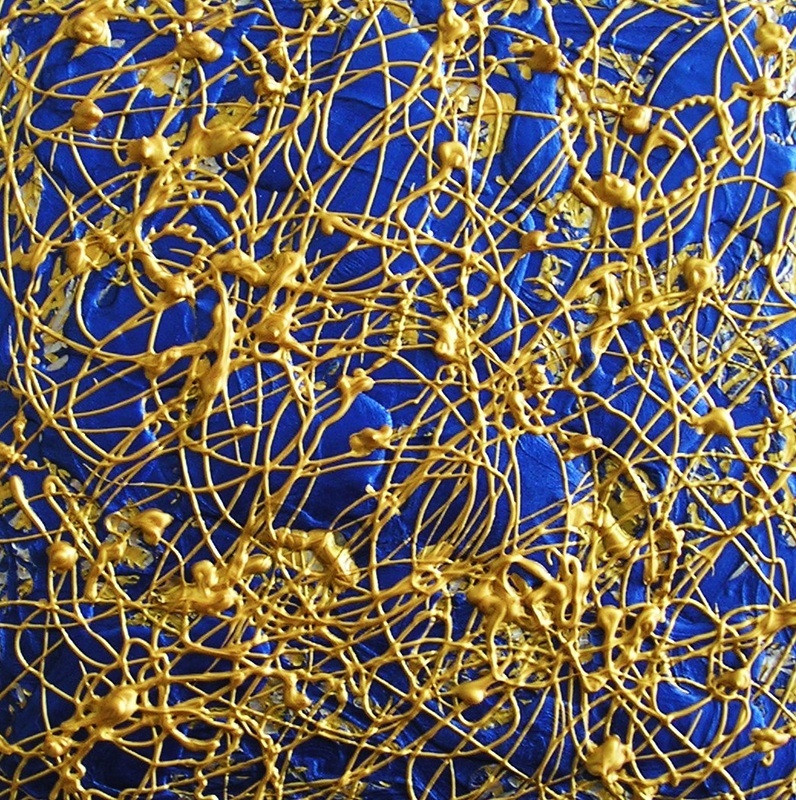 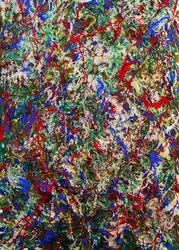 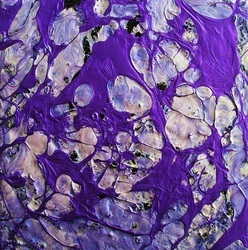 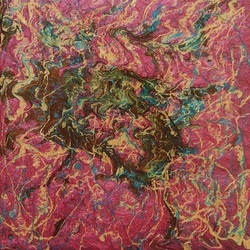 All paintings are available for sale within the USA. 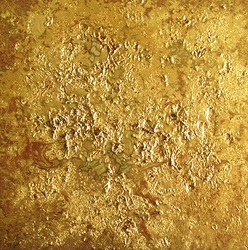 Shipping and Handling is FREE within the USA. 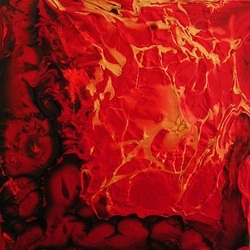 Please feel free to ask all questions through my PAINTING A DAY BLOG UNDER COMMENTS. 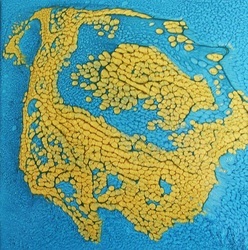 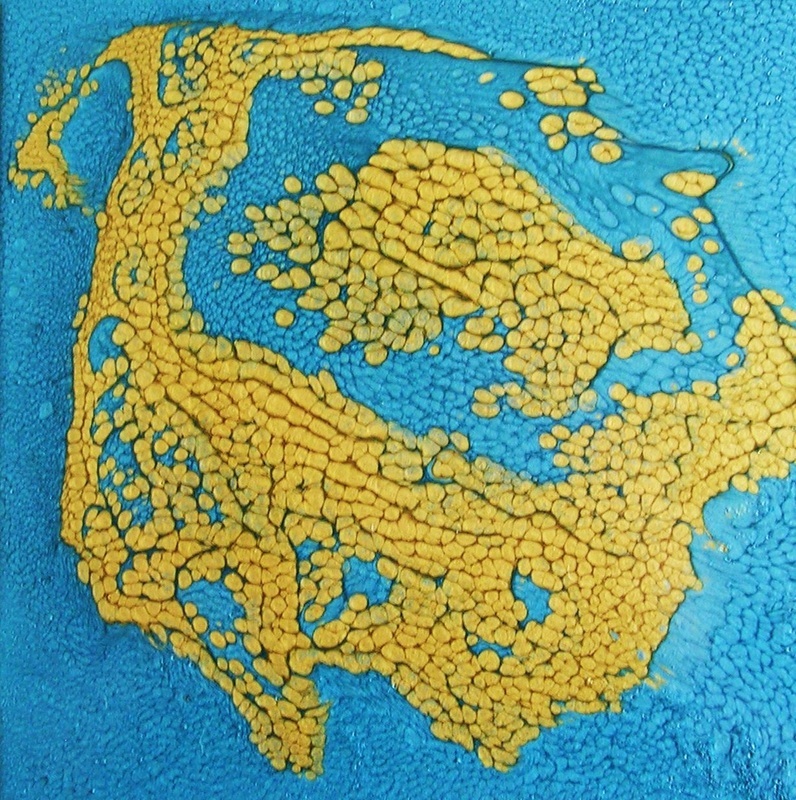 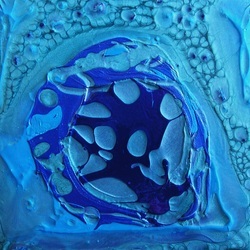 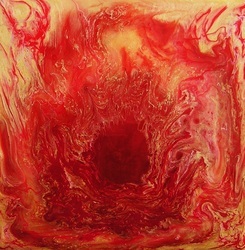 BIRTH is painted with mixed media paints on a 6"x6" Gessobord panel. 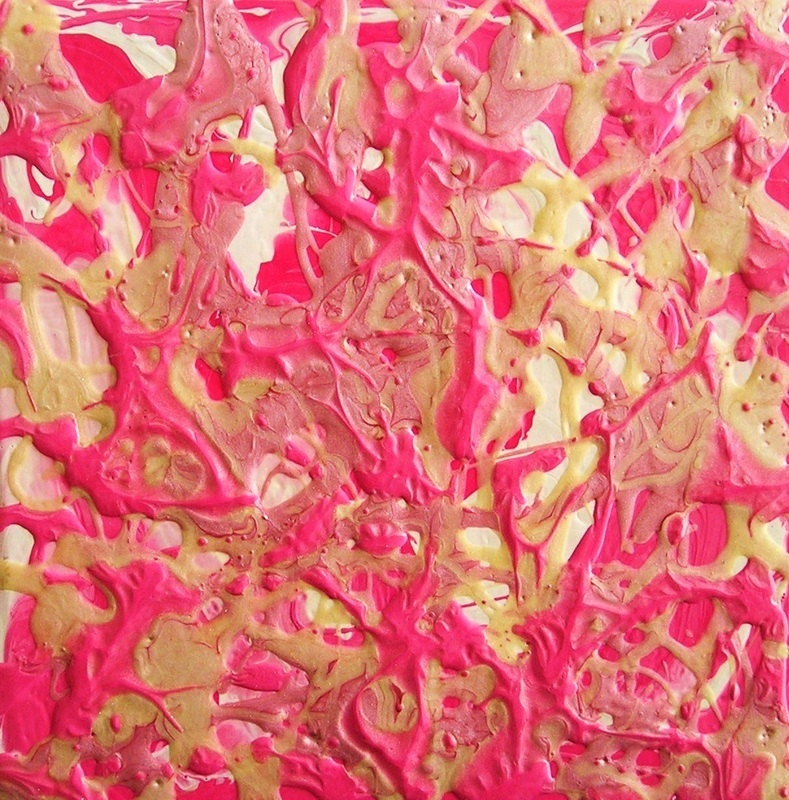 SPLASH OF PINK is part of my painting a day series of color splash paintings with the first one being SPLASH OF YELLOW. 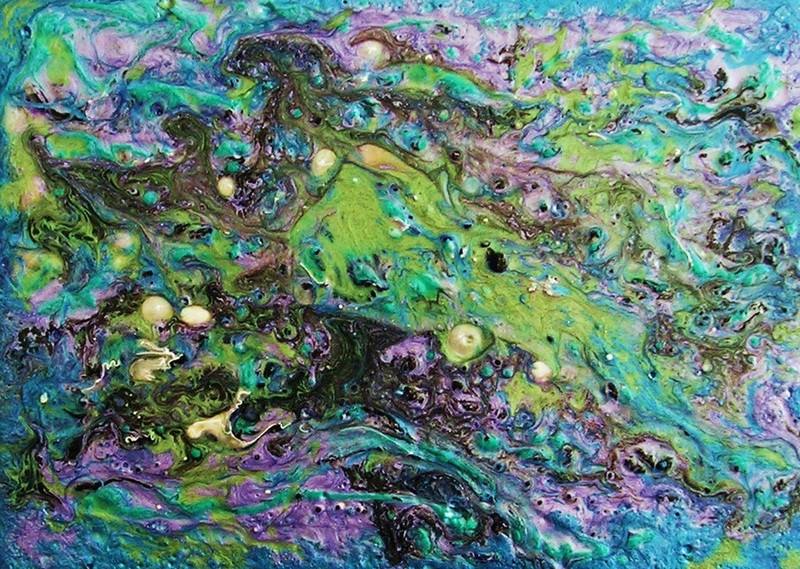 It is painted with acrylics, mixed media paints on a 6"x6" Gessobord panel. 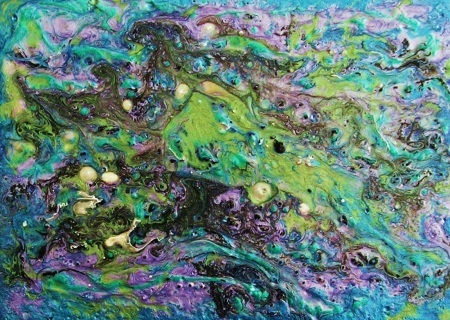 ETHEREAL is painted with mixed media paints on a 6x6" Gessobord panel. 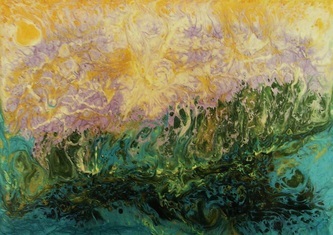 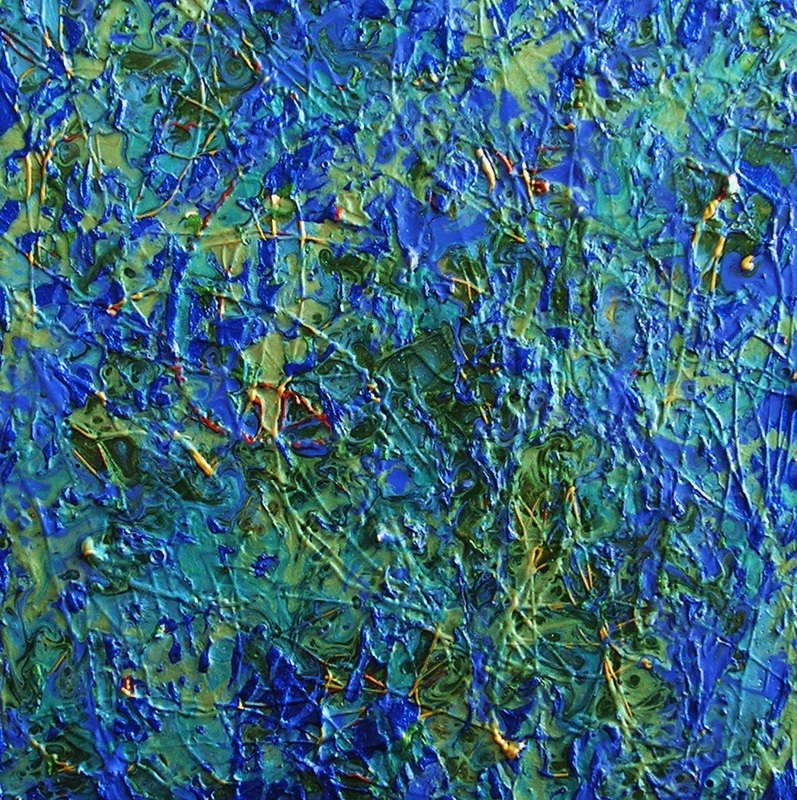 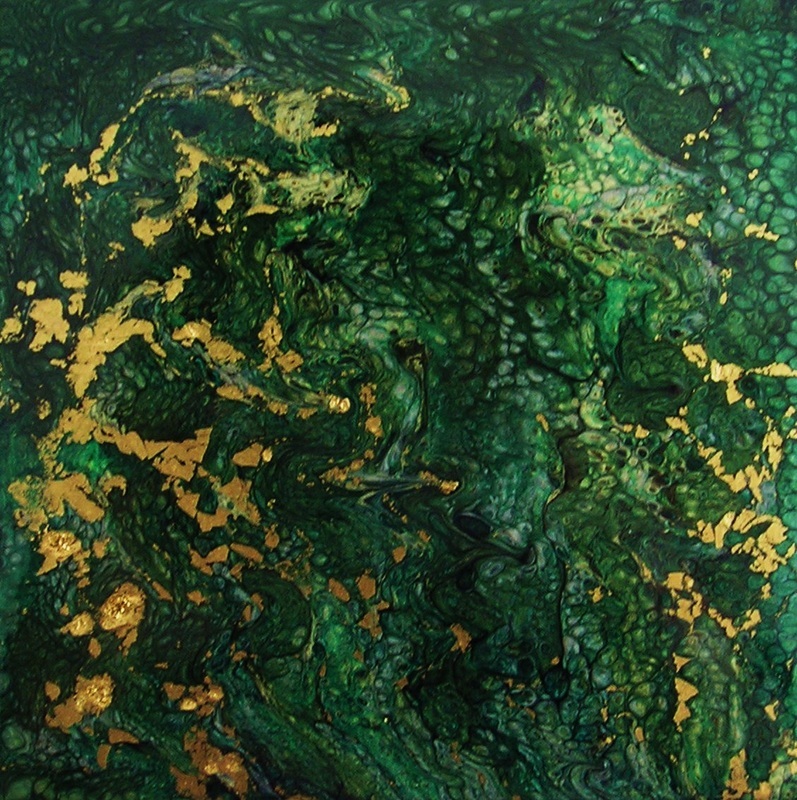 GREEN PEARL is an abstract mixed media painting depicting a fantasy garden filled with pearl flowers amongst the green grass. 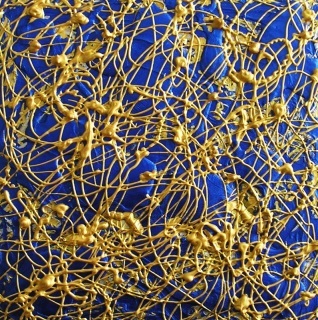 The garden is entwined with gold ribbons. 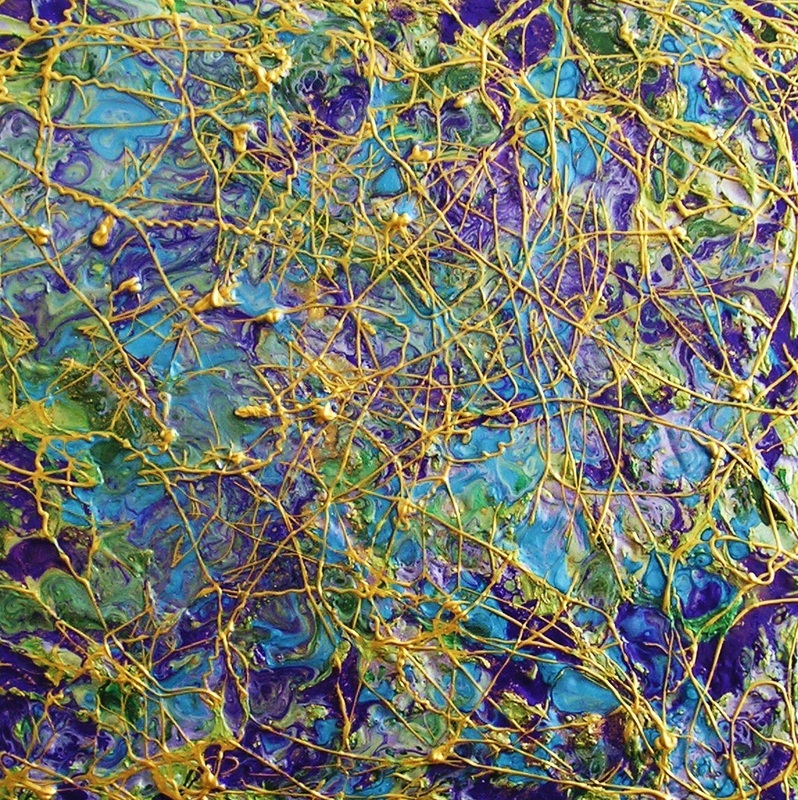 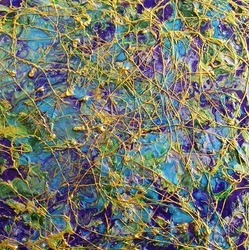 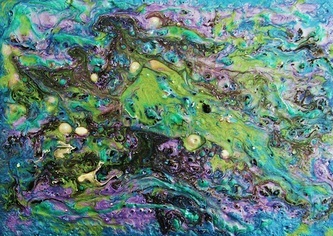 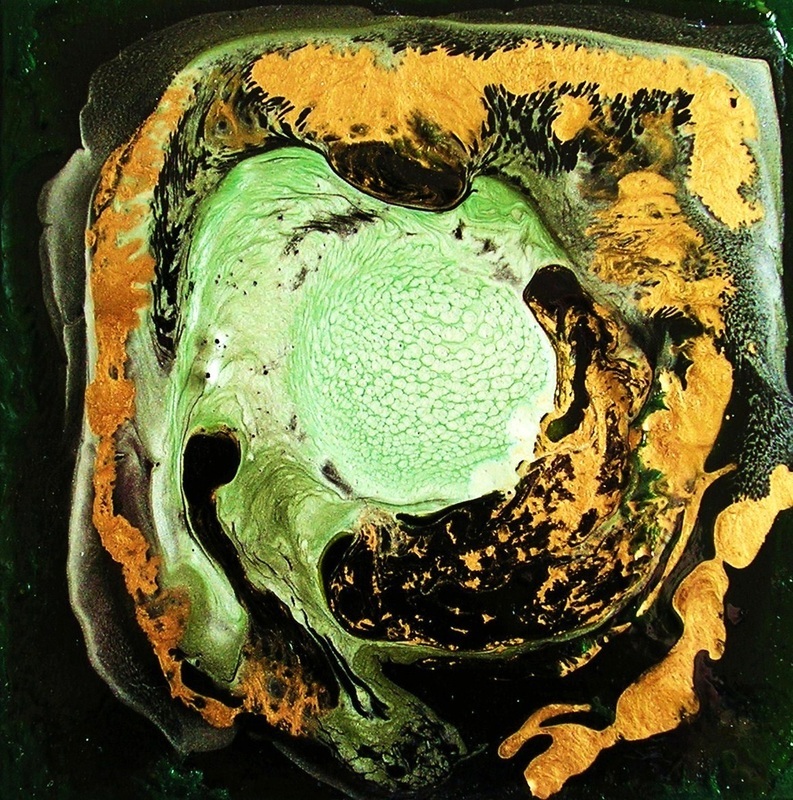 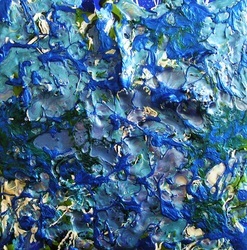 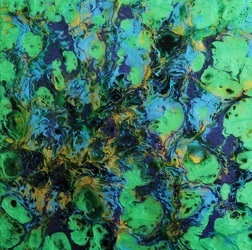 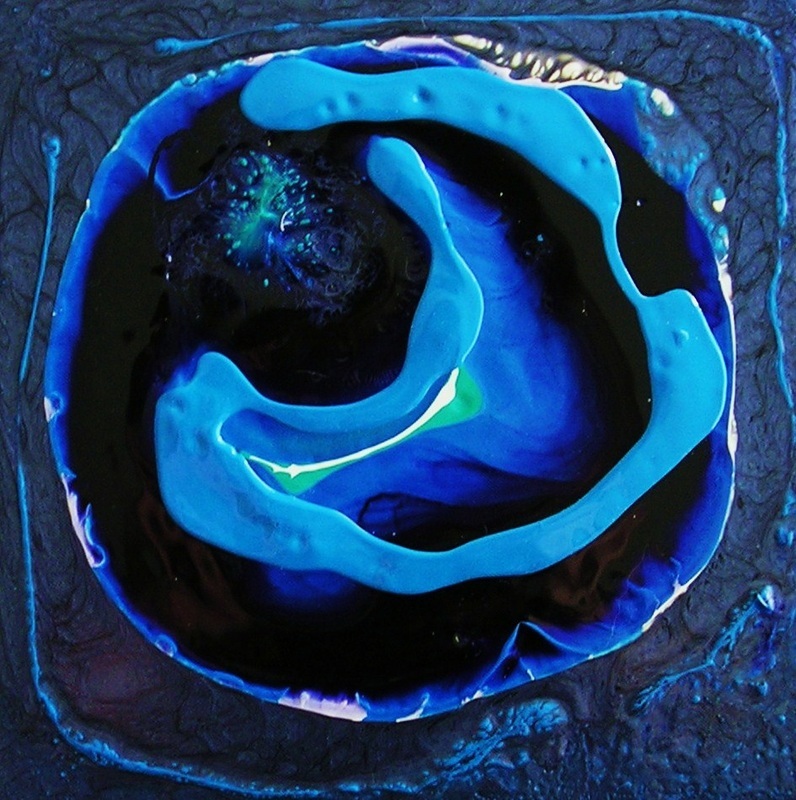 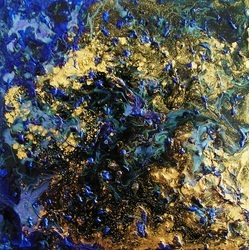 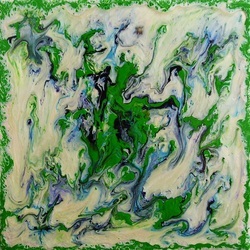 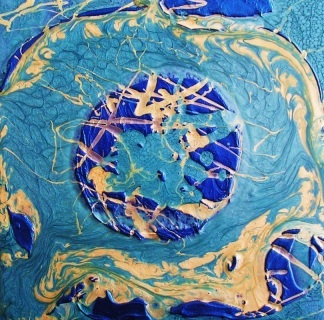 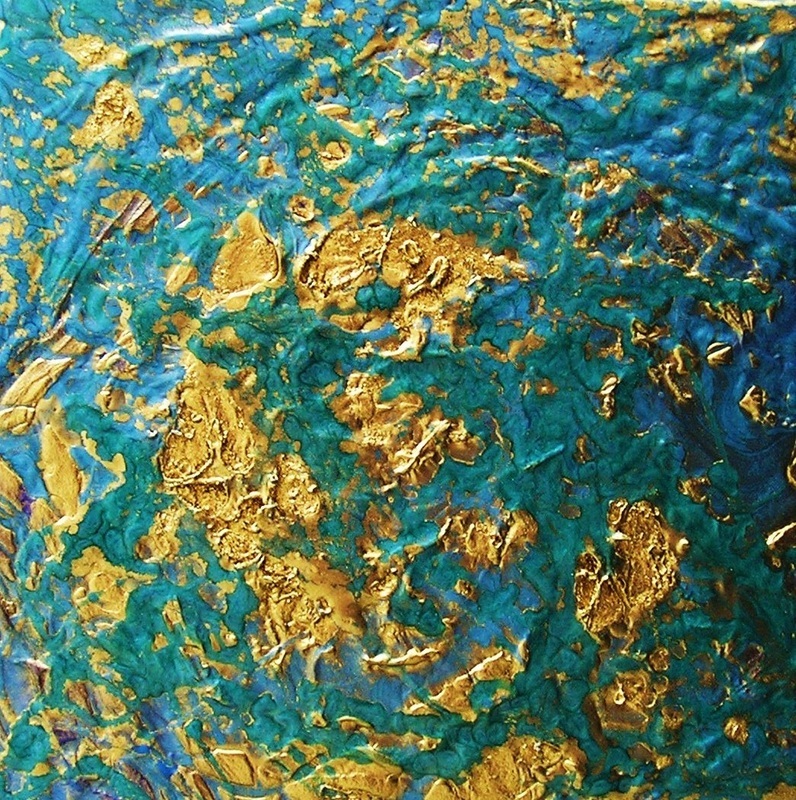 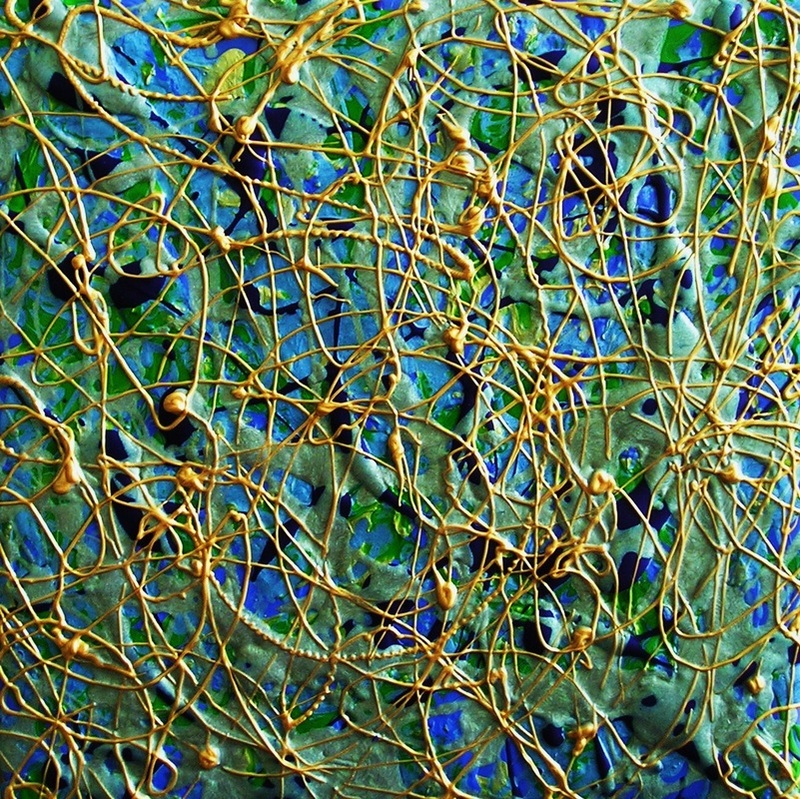 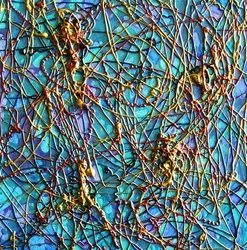 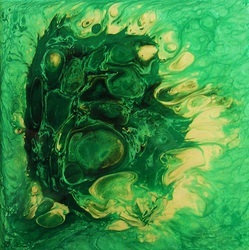 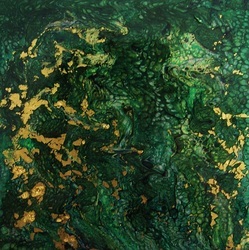 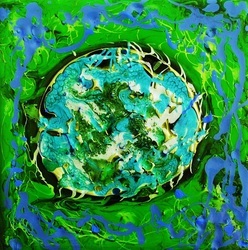 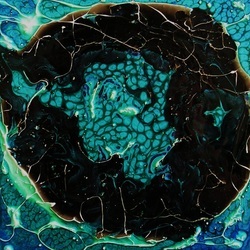 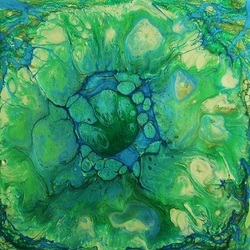 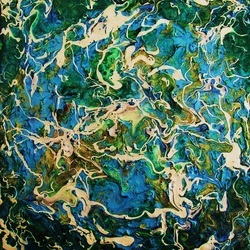 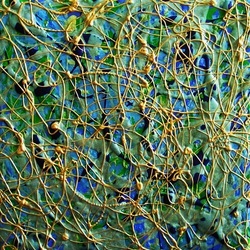 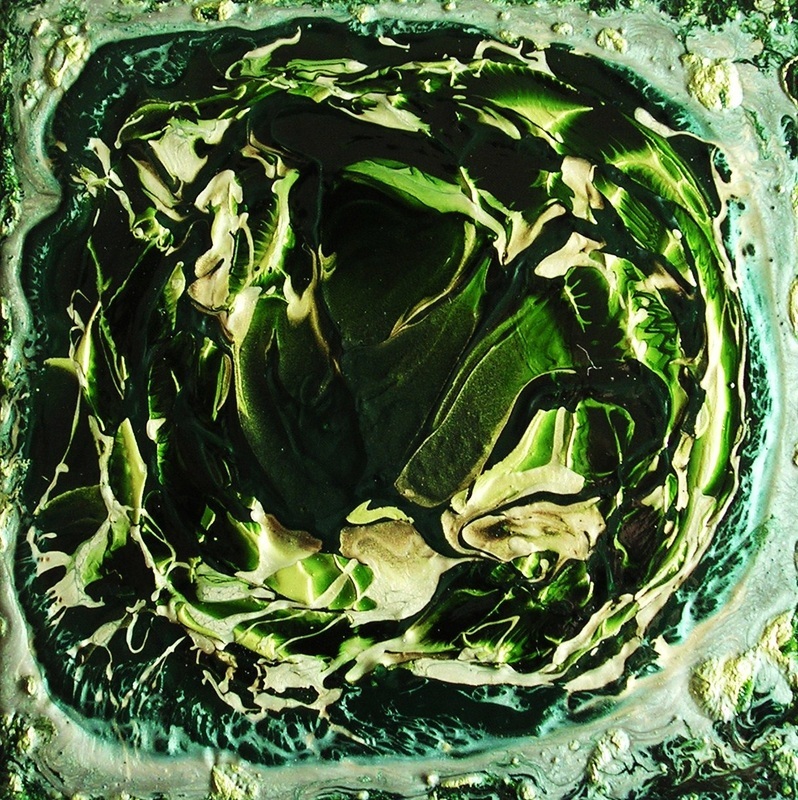 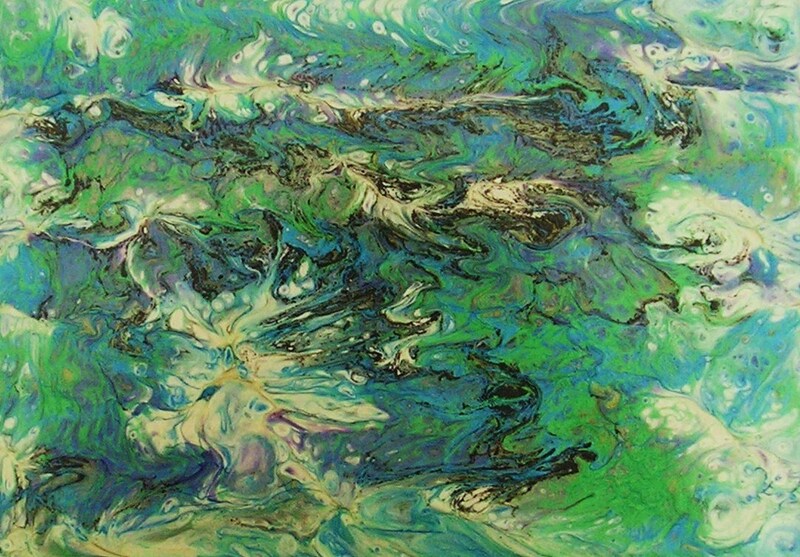 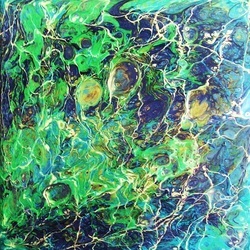 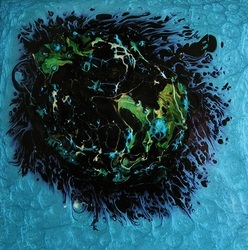 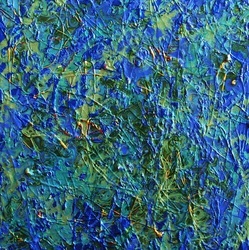 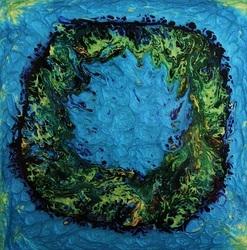 Green Pearl is painted with mixed media paints on a Gessobord panel. The INNER FLAME of life and love... 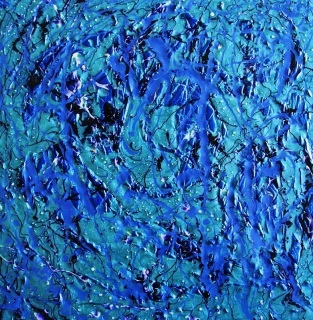 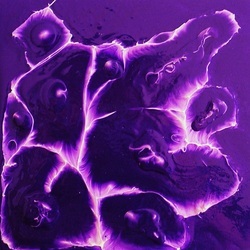 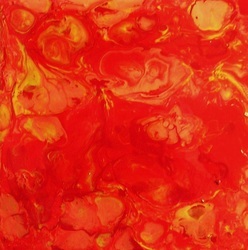 This has been one of my main studies in Spirituality through all of the various mystics such as St. John of the Cross, St. Teresa of Avila, the Hindu sages, Buddha... Much of my art has been the abstract movement of this INNER FLAME pushing through creating the paintings for over 20 + years. 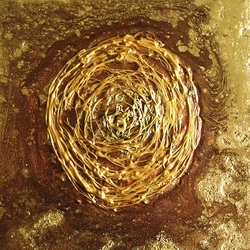 The mind leaves off and the Spirit takes over on this journey of art and life. on a 6"x6" Gessobord panel. Many of my new paintings in this series of a Painting A Day are about the colors, shape and elegance of the orchid flower. 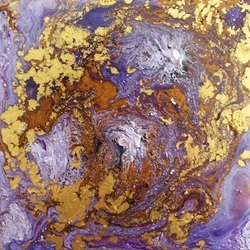 ORCHID is painted with mixed media paints on a 6"x6" Gessobord panel. 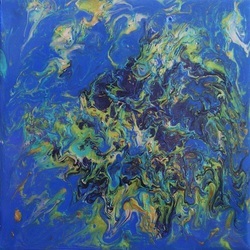 CLOUDS is painted on a 6"x6" Gessobord panel with mixed media paints. 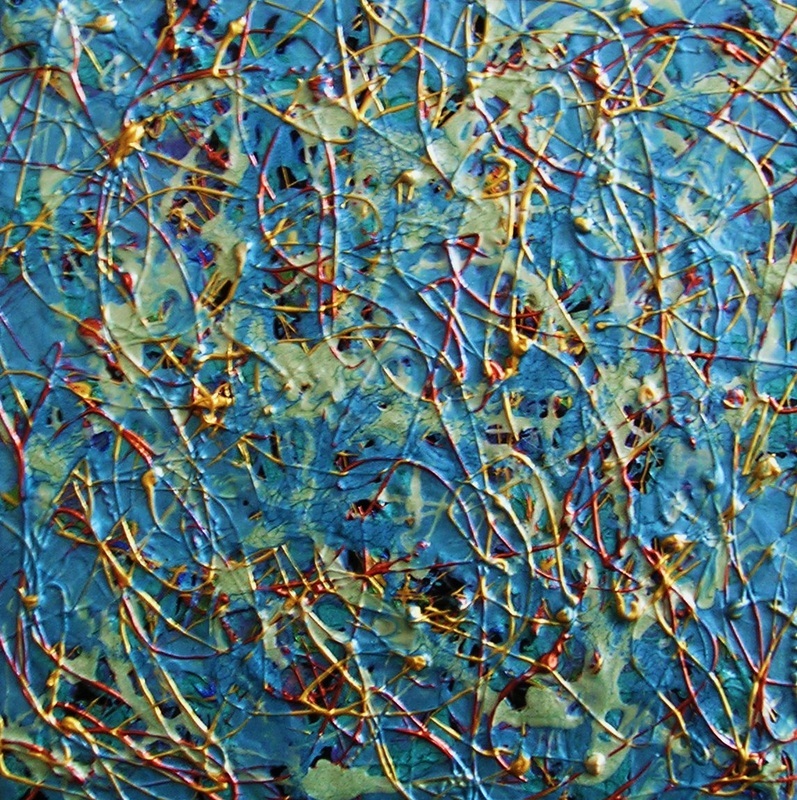 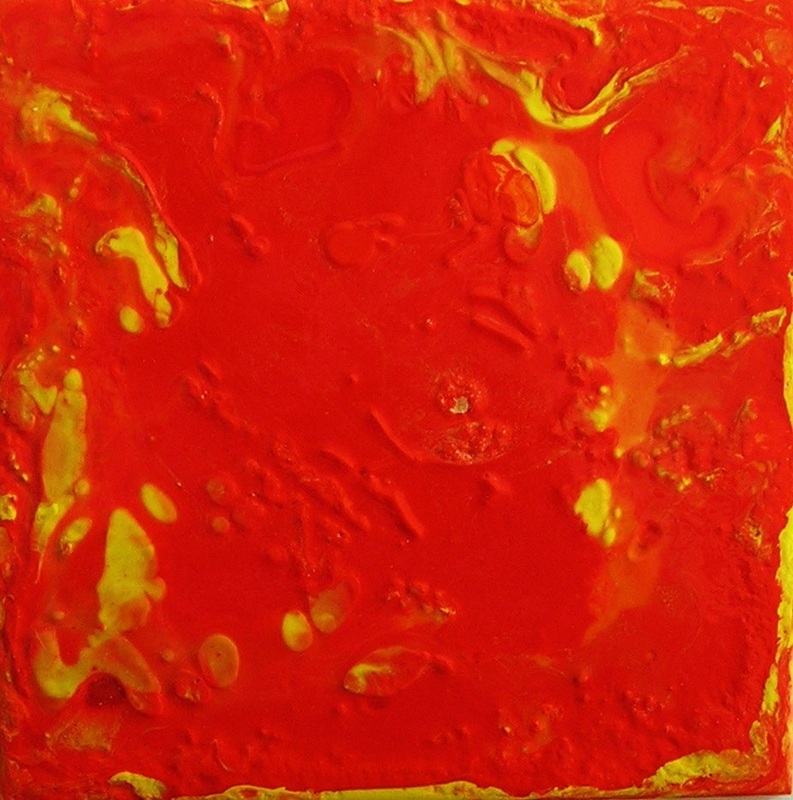 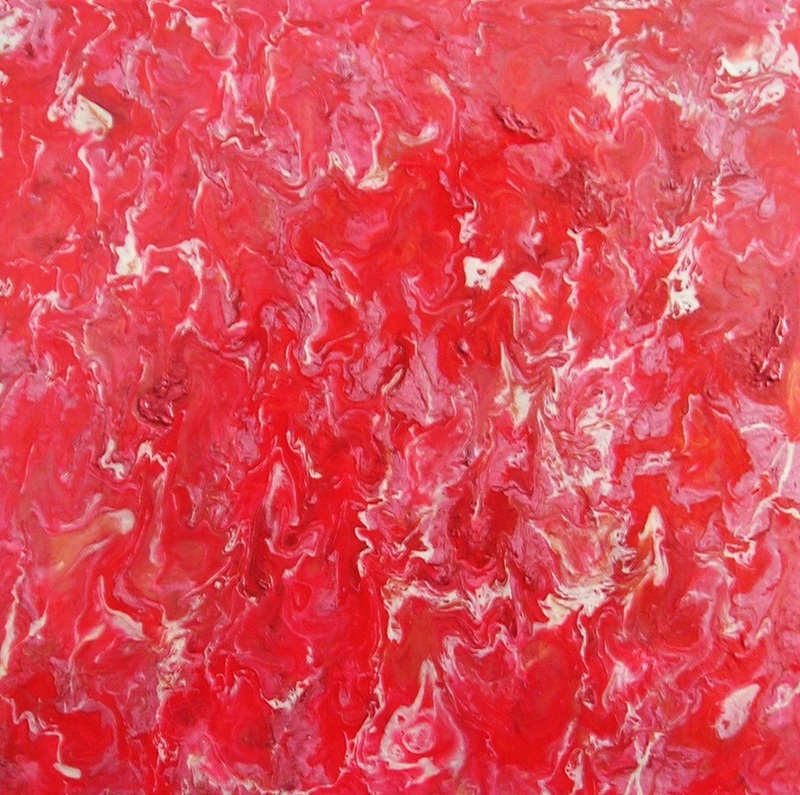 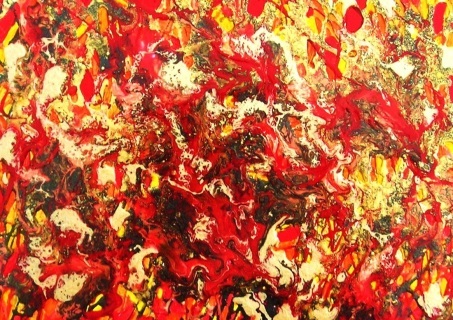 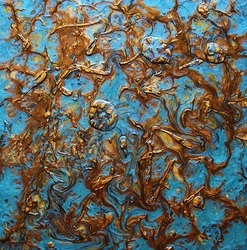 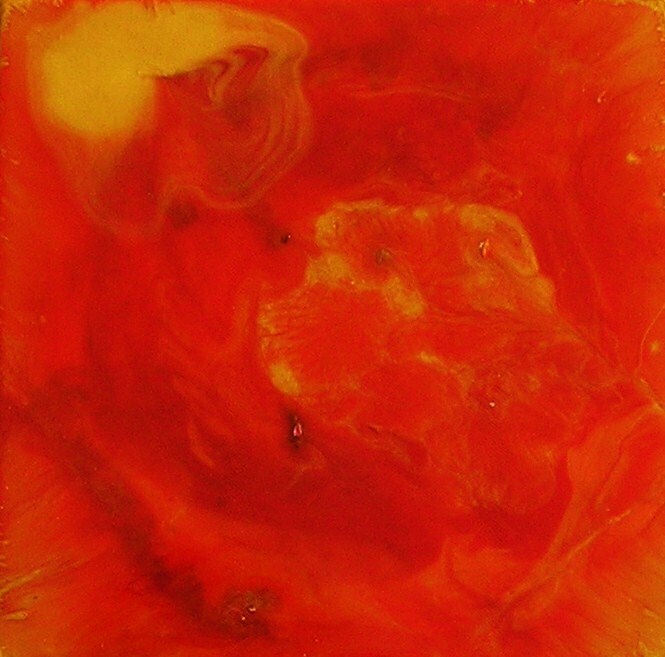 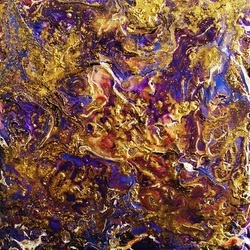 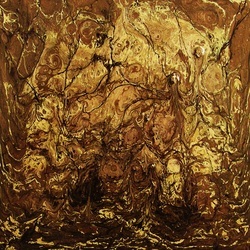 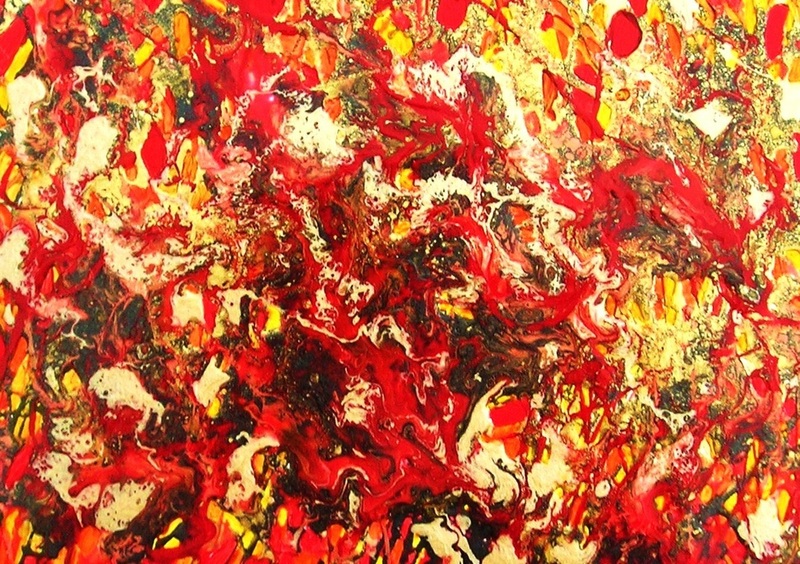 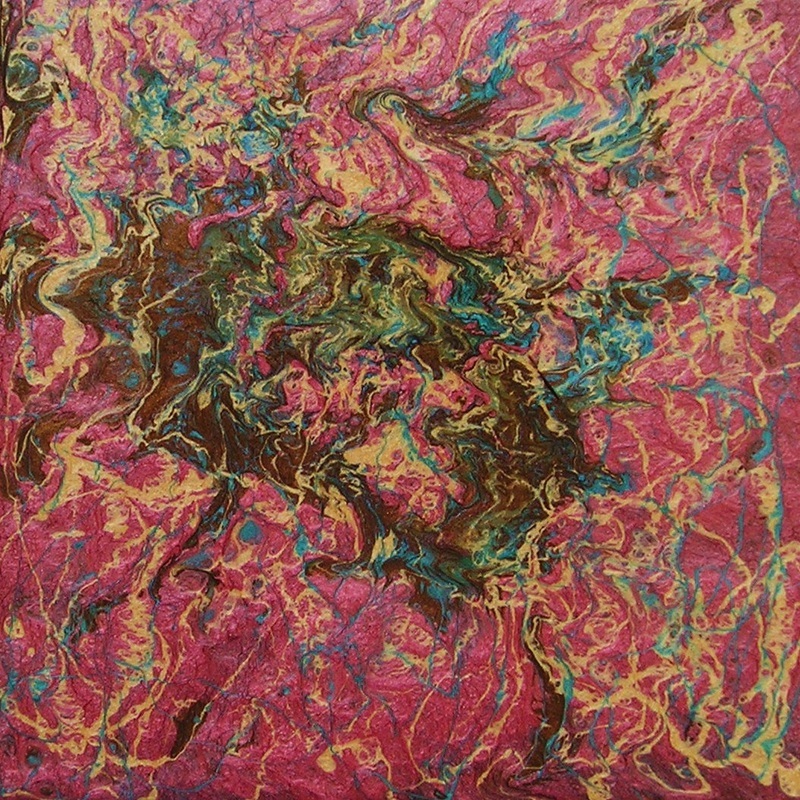 RED TIGER EYE is an abstract painting based on the Tiger's Eye gemstone. It is painted with mixed media paints on a 6x6" Gessobord panel. RED DRUZY is part of a new series depicting the crater formations in the druzy jewel in an abstract format. 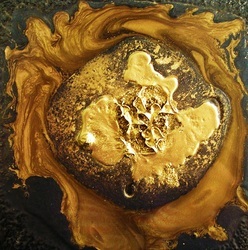 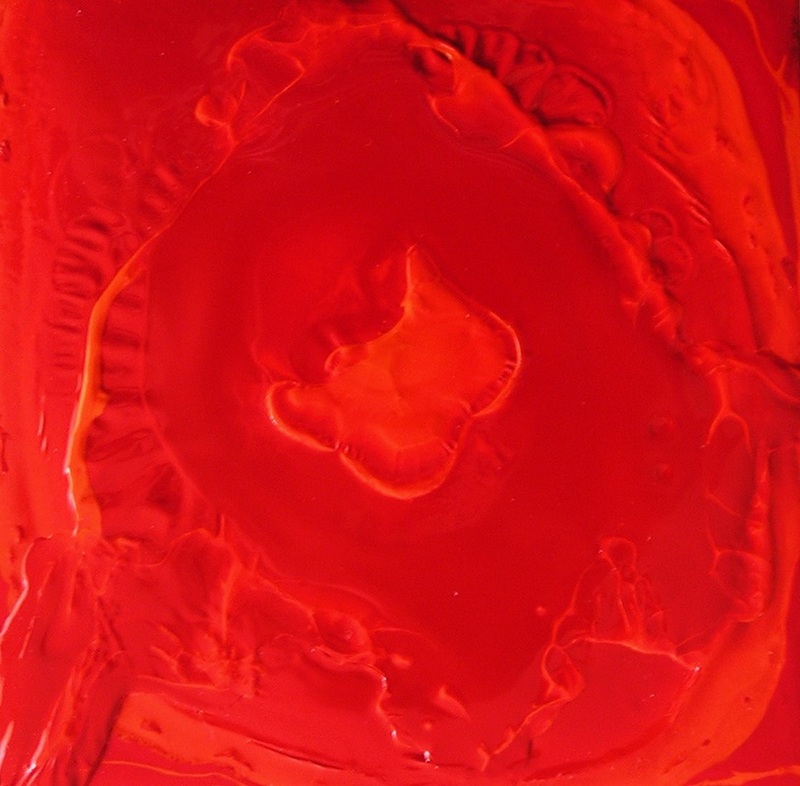 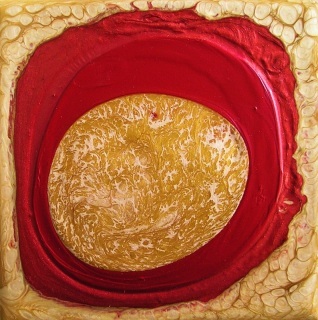 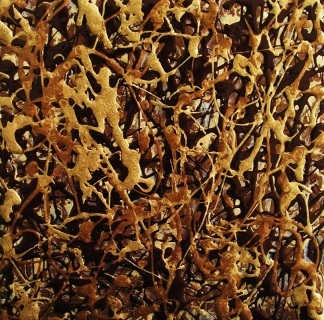 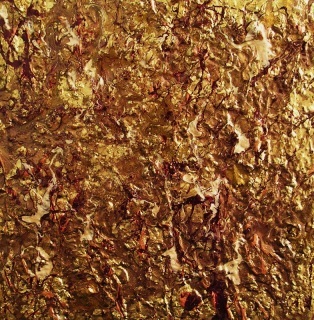 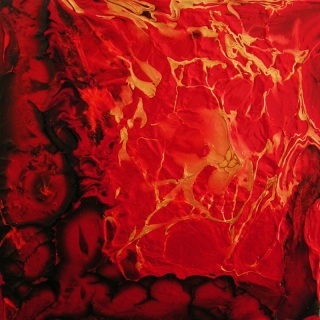 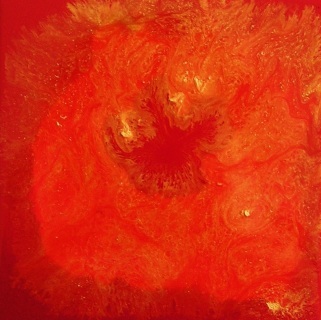 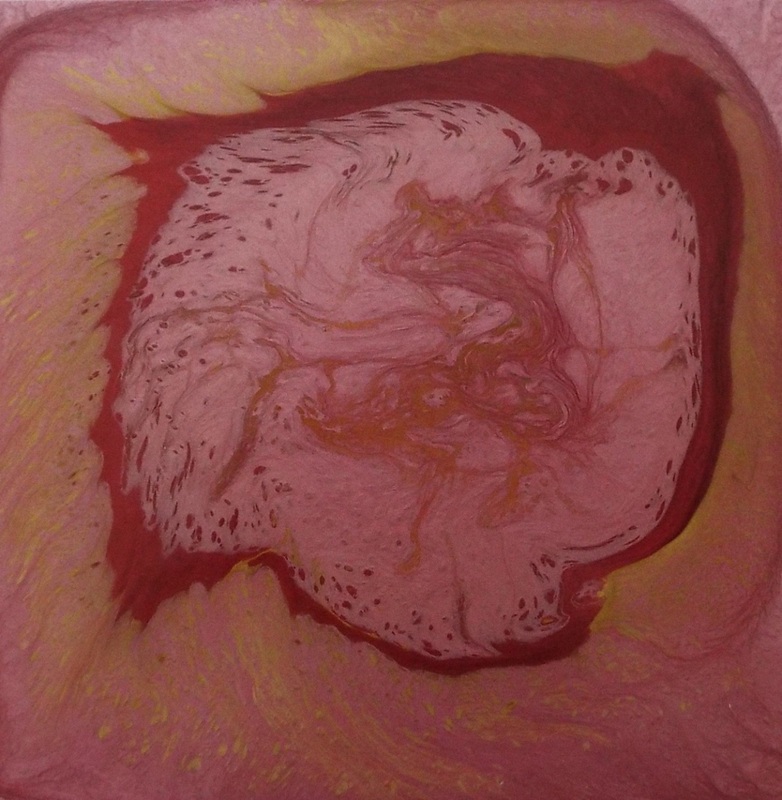 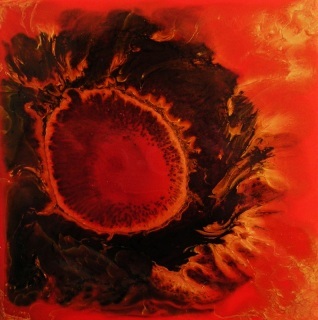 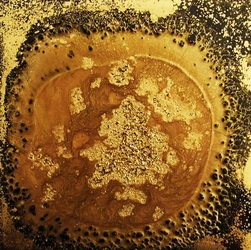 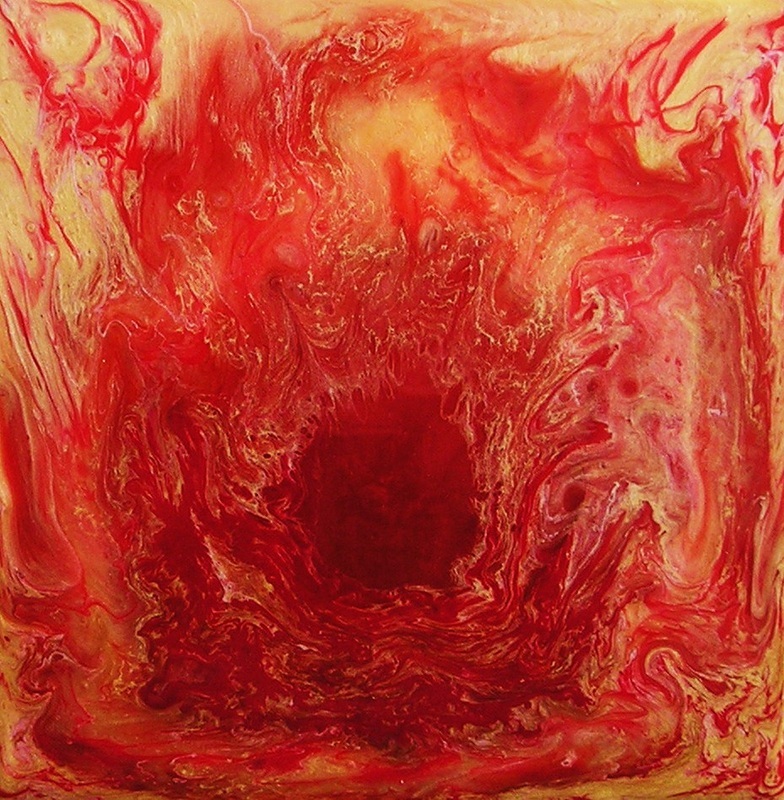 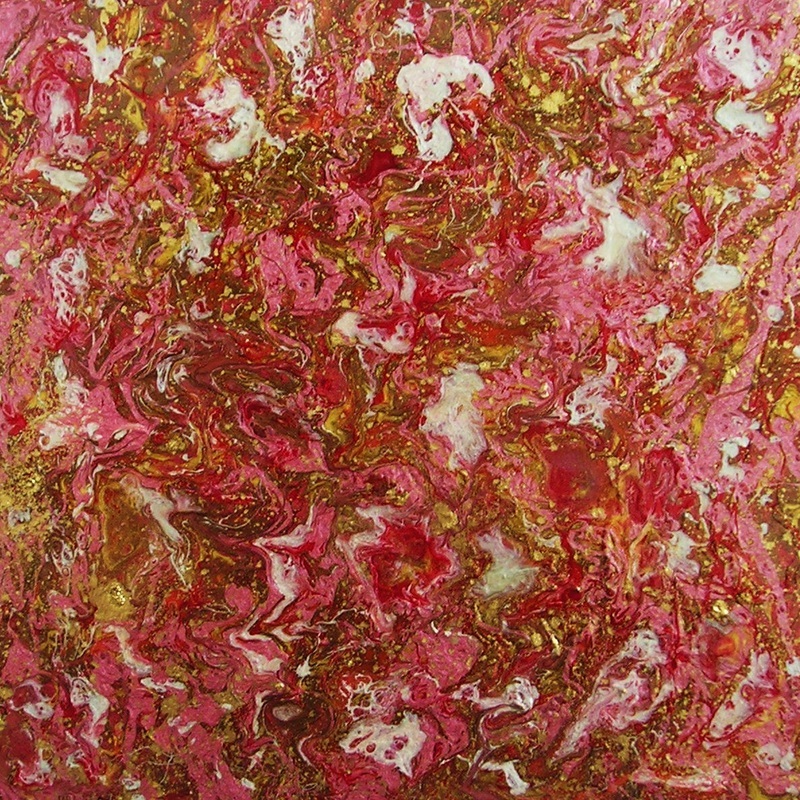 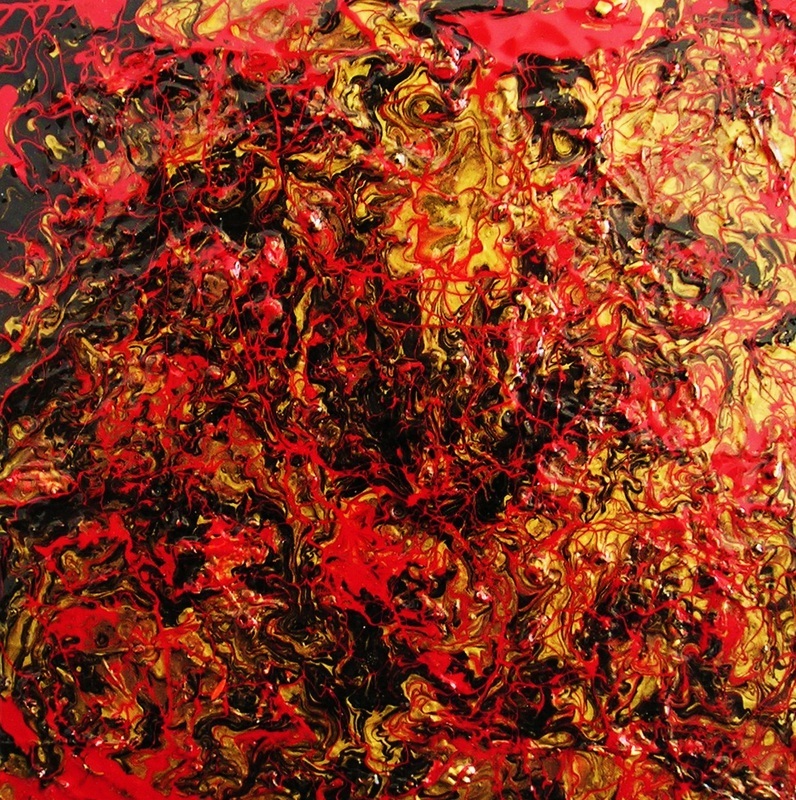 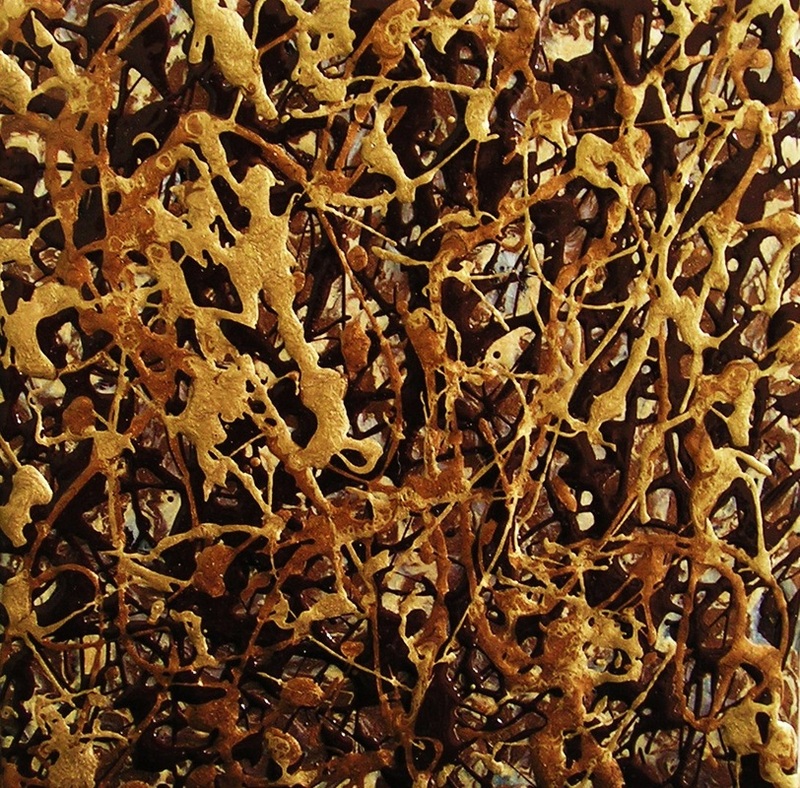 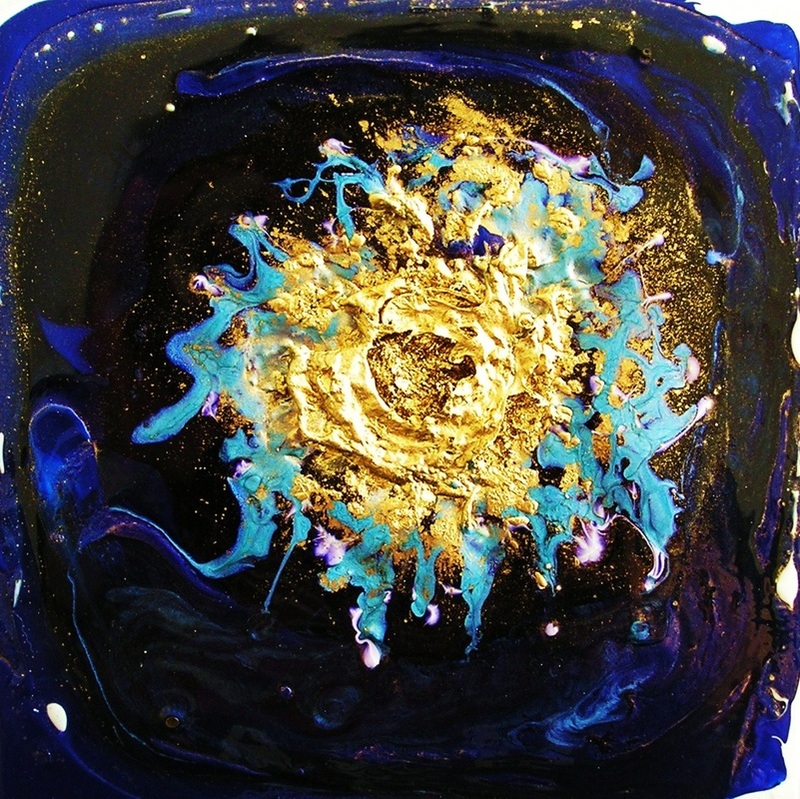 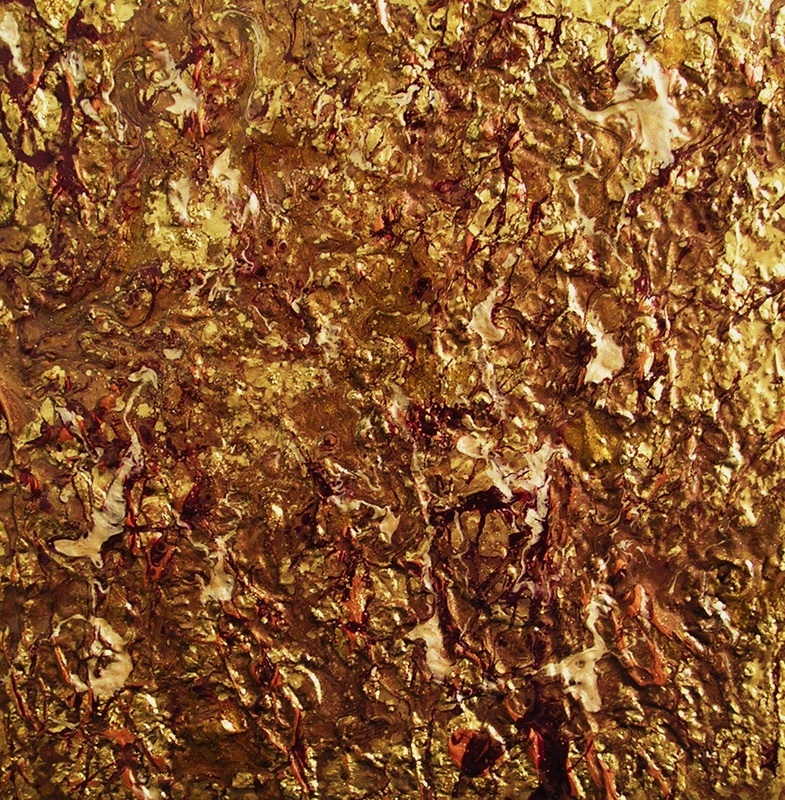 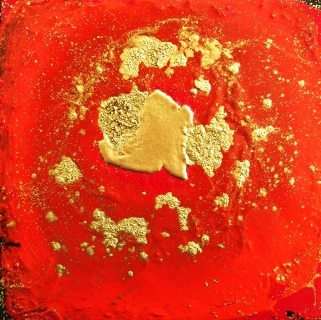 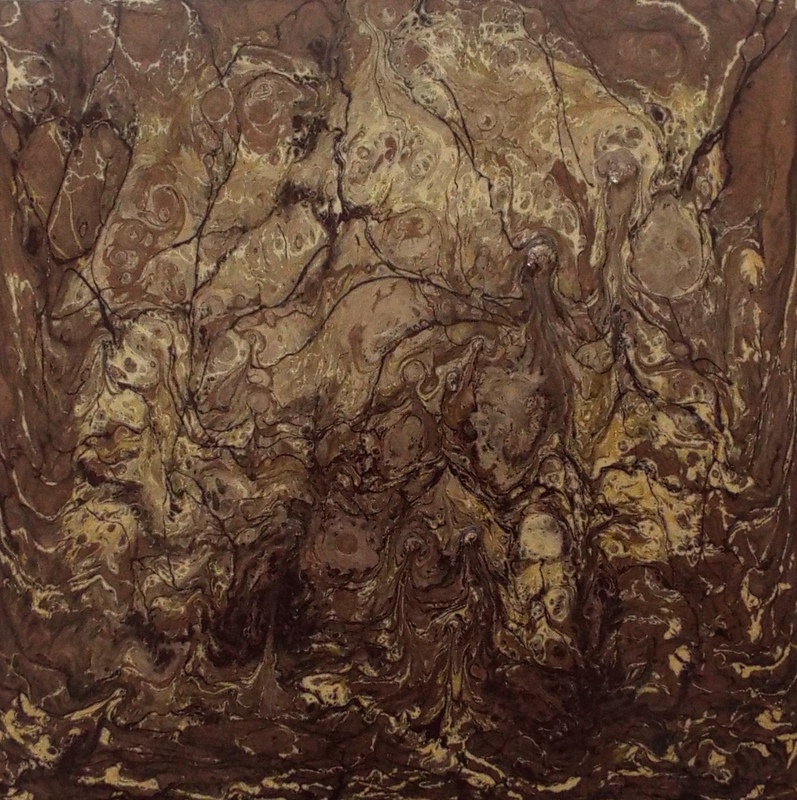 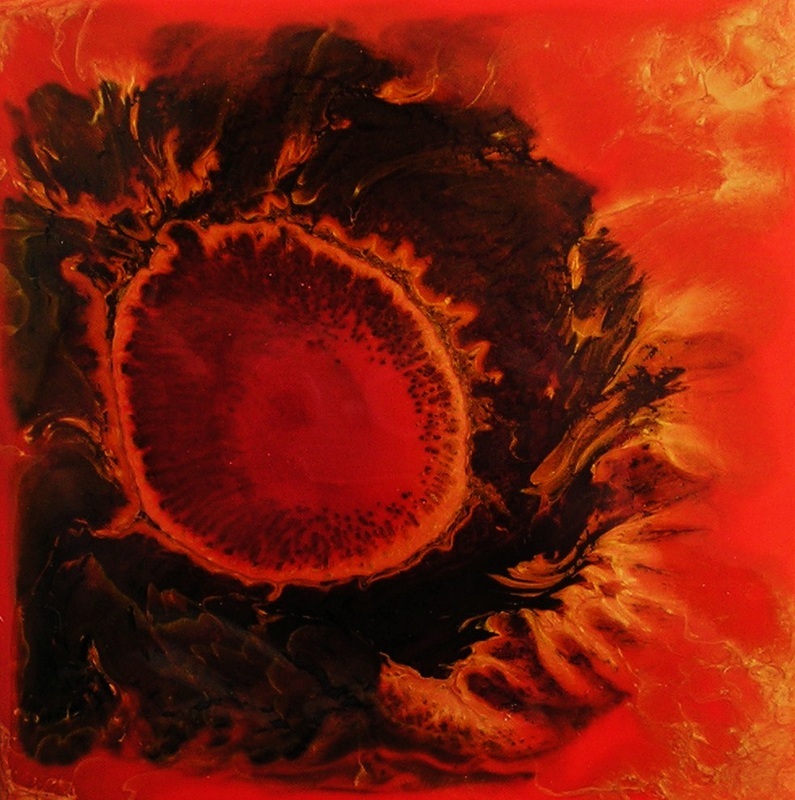 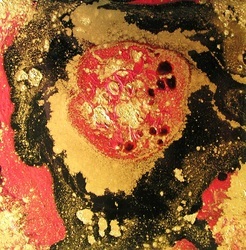 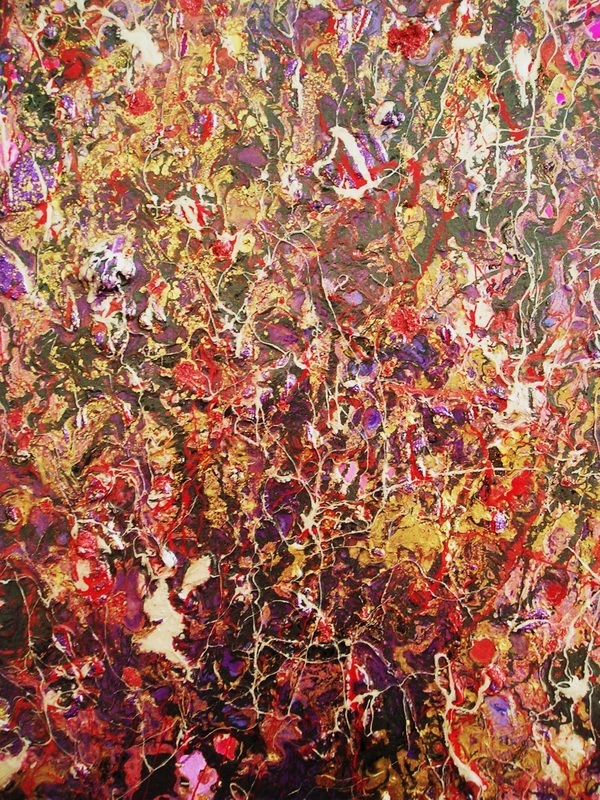 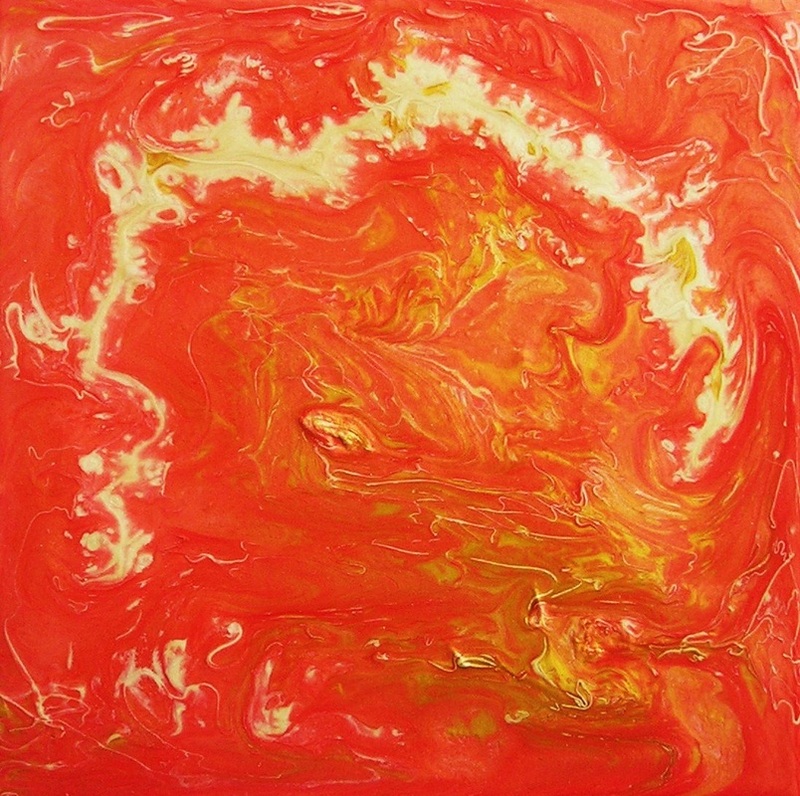 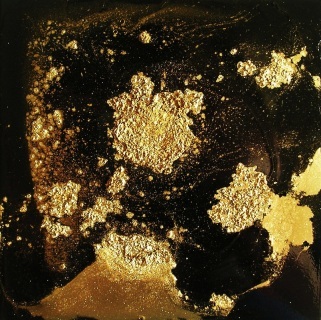 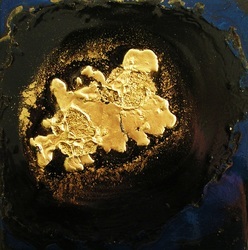 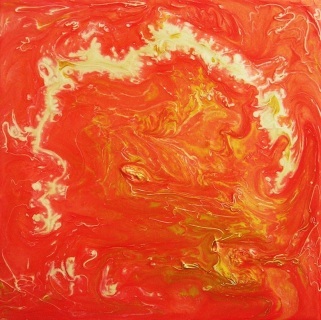 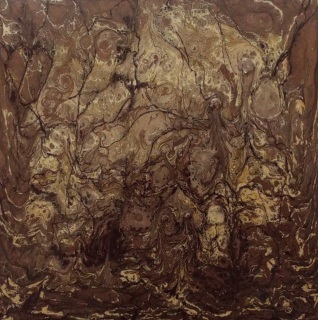 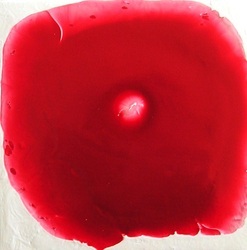 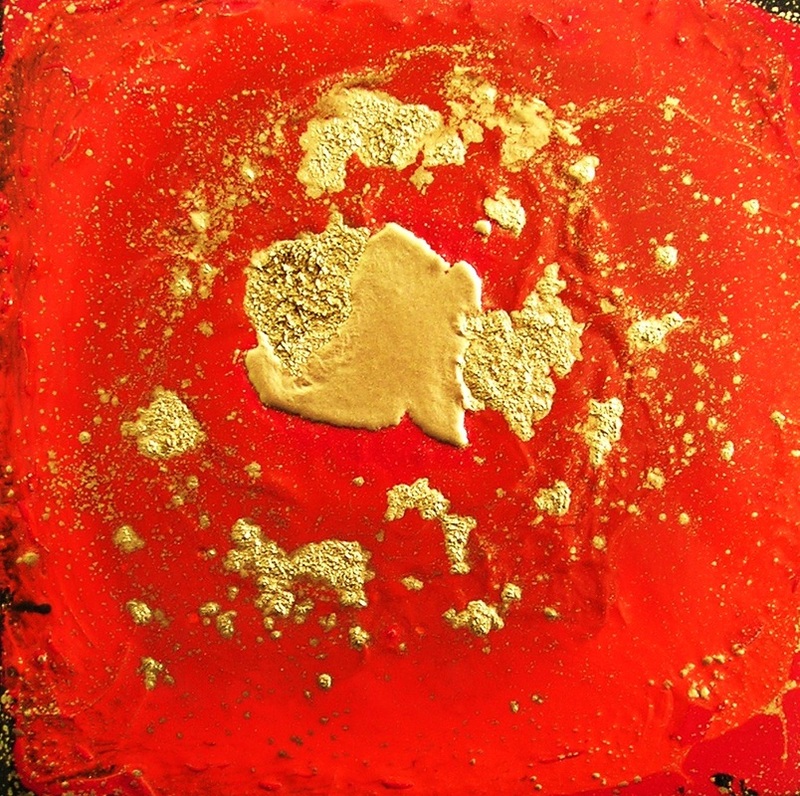 This painting reminds me of a volcanic crater with the lava flow of deep red against the gold. It is painted with mixed media paints on a 6"x6" Gessobord panel. 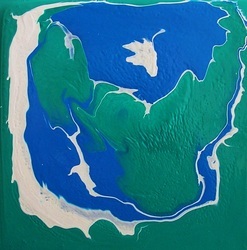 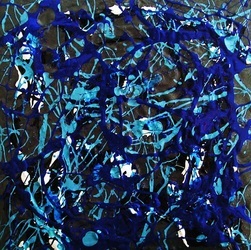 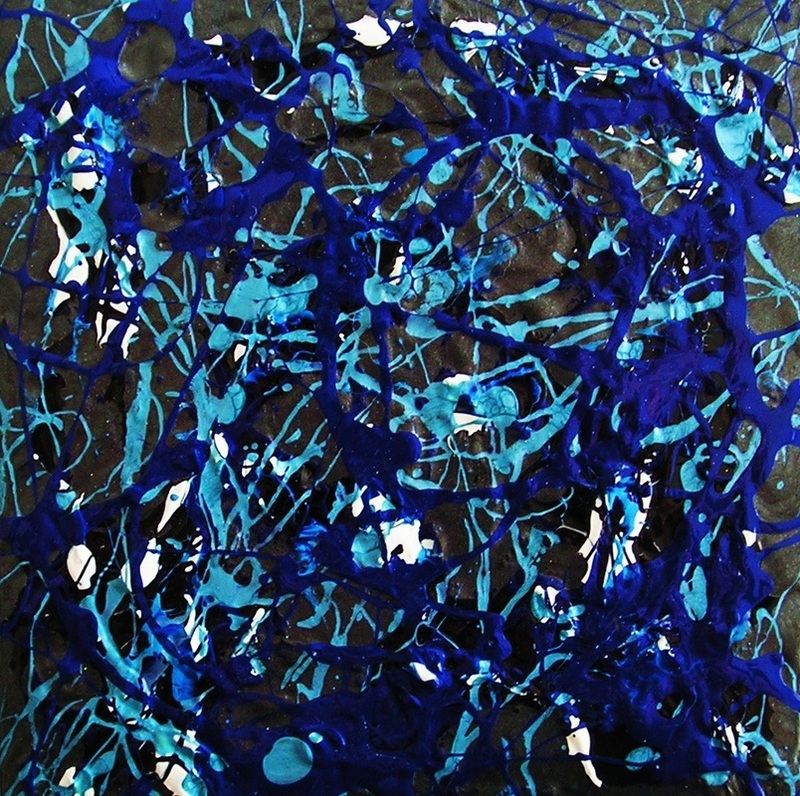 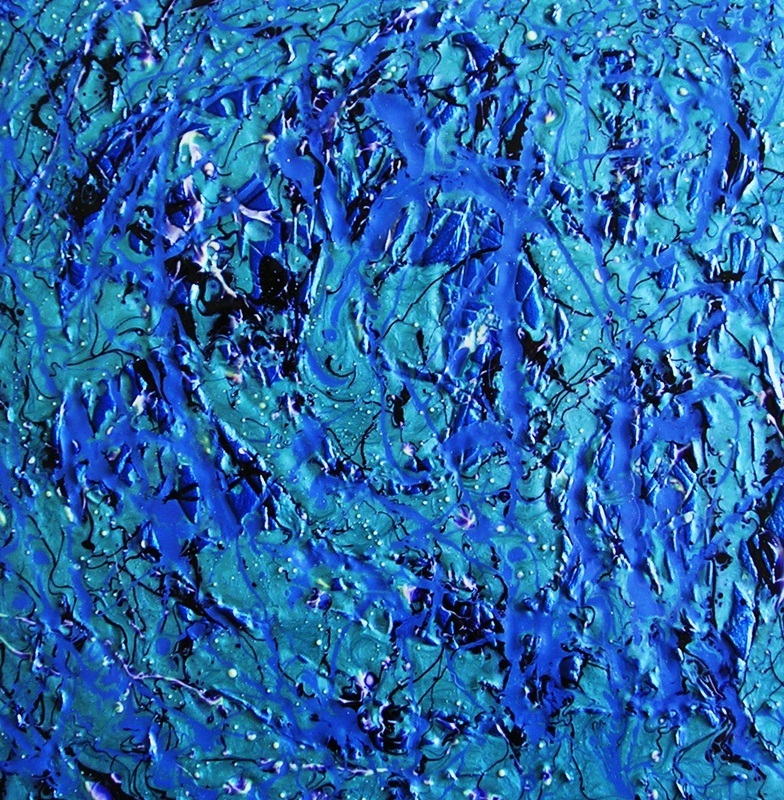 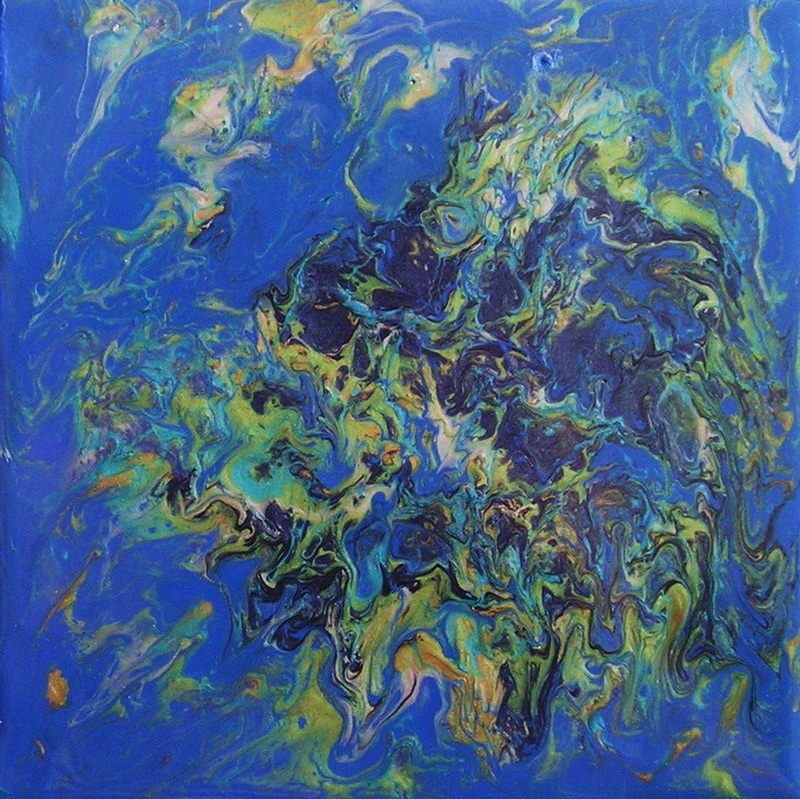 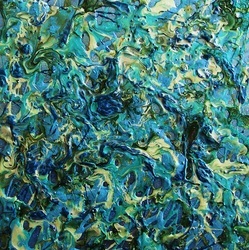 The AQUA WATER of Miami... Florida with it's oceans, bay and lakes is what has kept me painting for the last 20+ years. The sun shining on the ocean as it reflects the colors of turquoise, aqua, greens and deep blues. 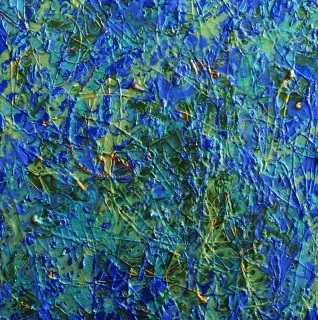 This has been one of the main inspirations for all my sculpted large paintings and now my 6"x6" PAINTING A DAY mixed media art. 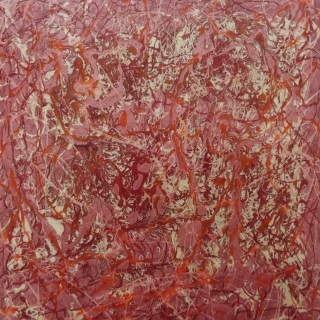 ROSE PETALS... 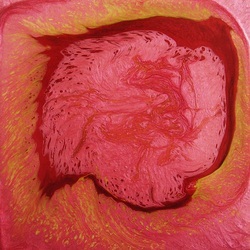 The majestic beauty of a rose... As a teenager I would love to make rose water with pink rose petals... 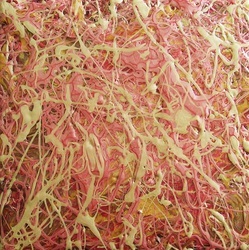 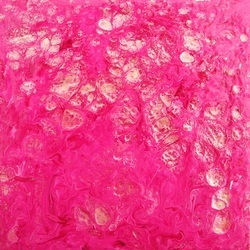 This painting is a depiction of the falling magenta pink rose petals painted with acrylics and mixed media paints on a 6"x6" Gessobord panel. 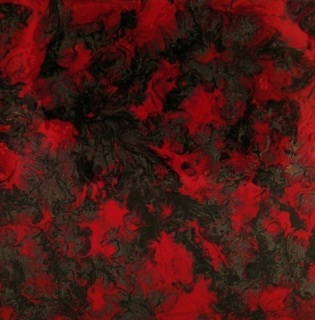 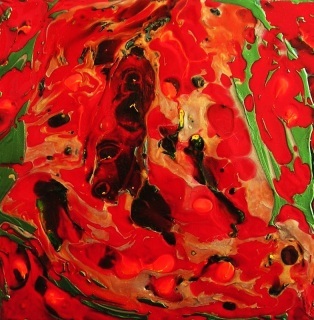 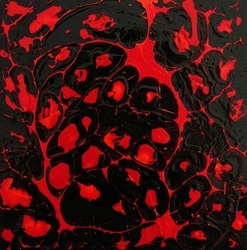 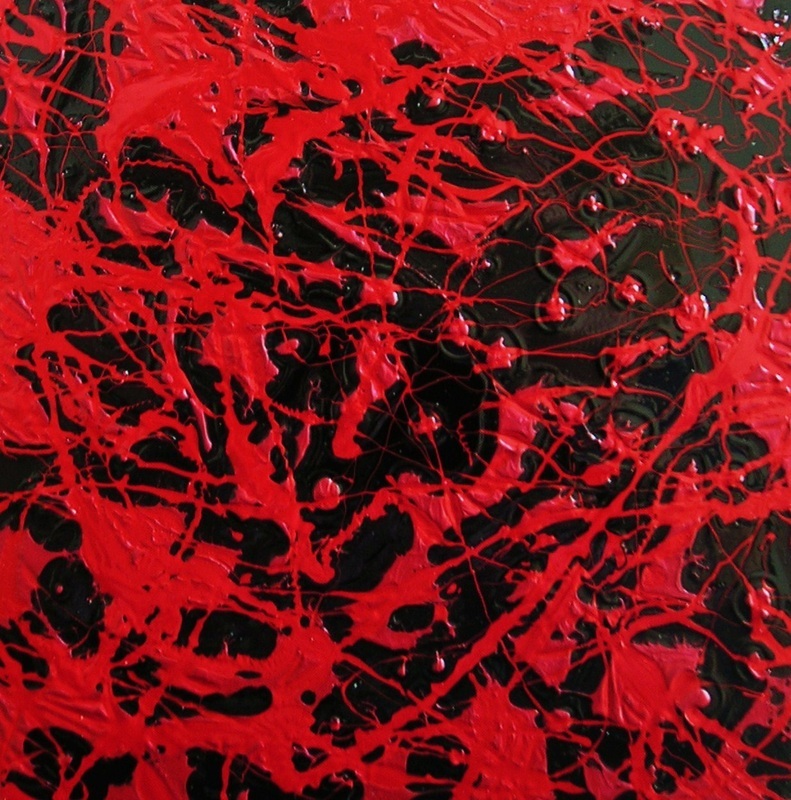 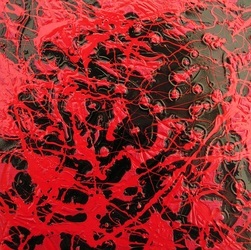 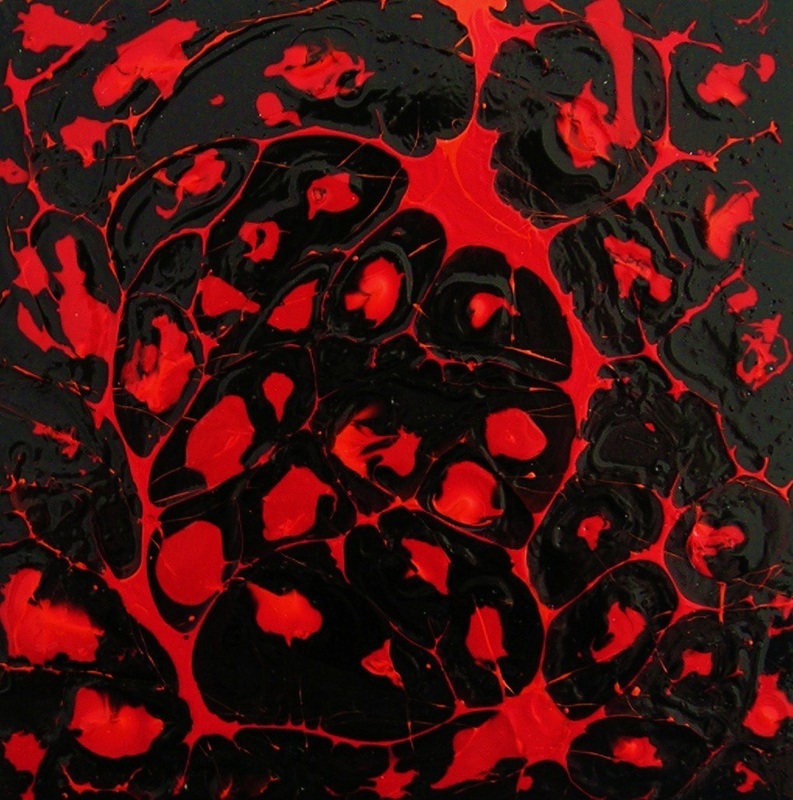 Many of my paintings are an abstraction of red and black... This new painting RED ABSTRACTION is a continuation in this series painted with mixed media paints on a 6"x6" Gessobord panel. 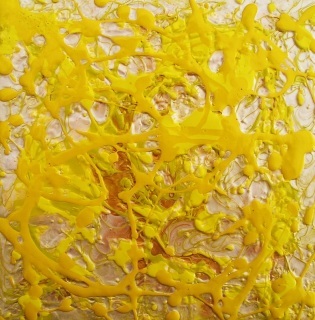 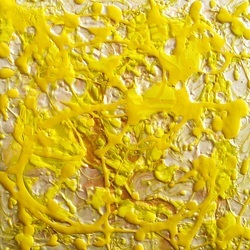 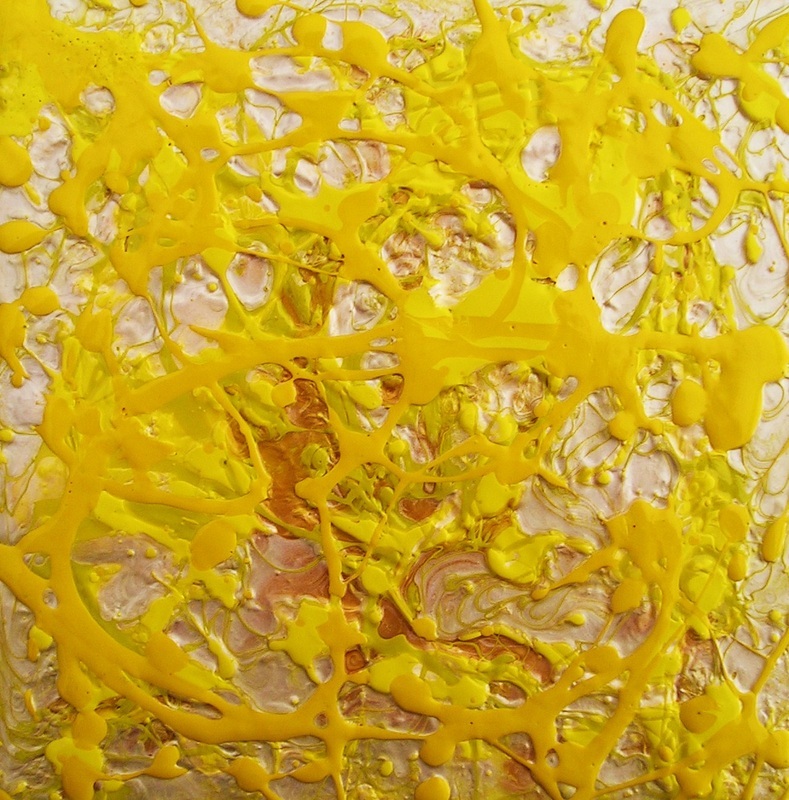 SPLASH OF YELLOW... A primary color that stands alone against a vanilla Mother of Pearl swirl... 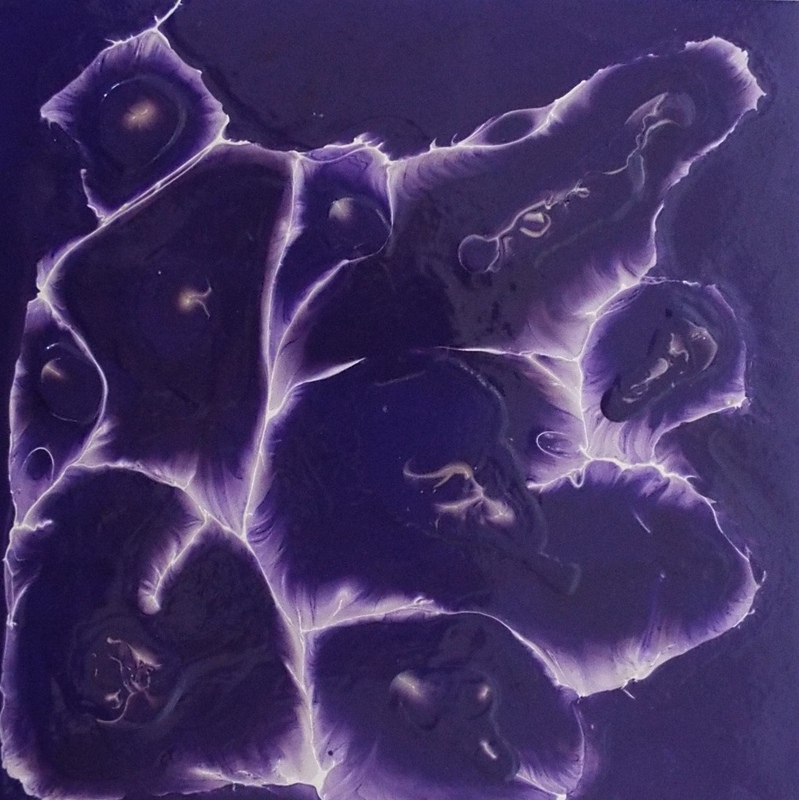 This painting is painted with acrylics and mixed media paints on a 6"x6" Gessobord panel. 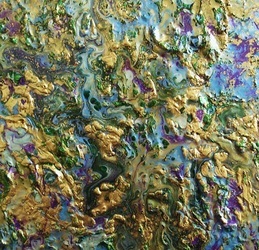 MOTHER OF PEARL is a new mixed media painting which depicts the beauty of mother of pearl whether in painting or on a musical instrument such as a guitar or accordion. 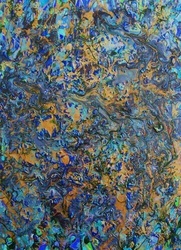 As a child I loved to play many musical instruments which were inlaid with mother of pearl. 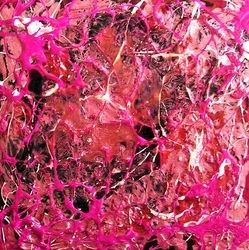 I was drawn to the reflections and shadows of this most beautiful pearl... This painting is painted with mixed media paints on a 6" x 6" Gessobord panel. 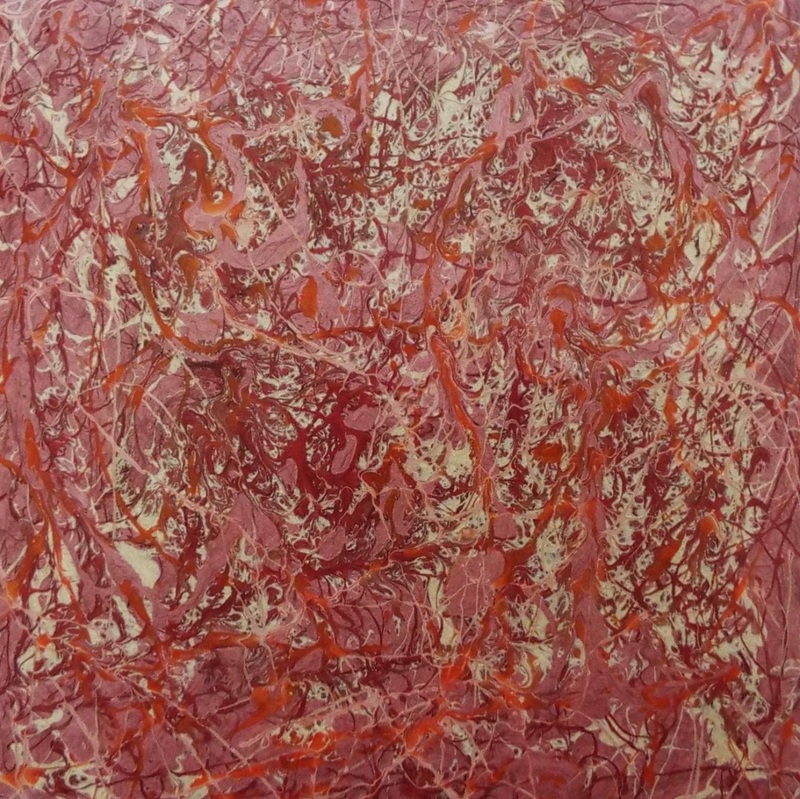 New mixed media painting titled CORAL RED is a tapestry of rich coral reds and gold painted on a 6" x 6" Gessobord panel with mixed media paints. 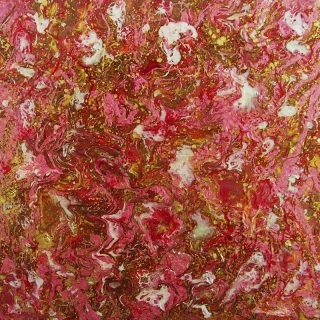 A garden filled with delicate pink and white miniature roses in an enchanted land of gold... ROSE GOLD is a majestic garden of fairy tales... 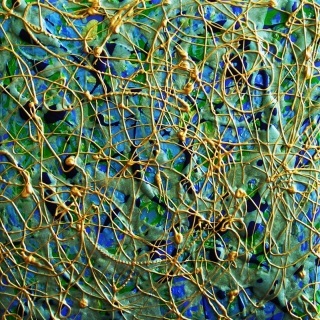 This is a new mixed media painting on a 6" x 6" Gessobord panel. 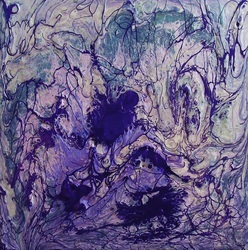 The winter snow covering the flowers in the garden muting them in light shades of pink, mauve, purple and violet... WINTER GARDEN is painted with acrylics, mixed media paints on a 6" x 6" Gessobord panel. The fall with it's changing foliage of golden brown patterns strewn across the sidewalks of Ohio... 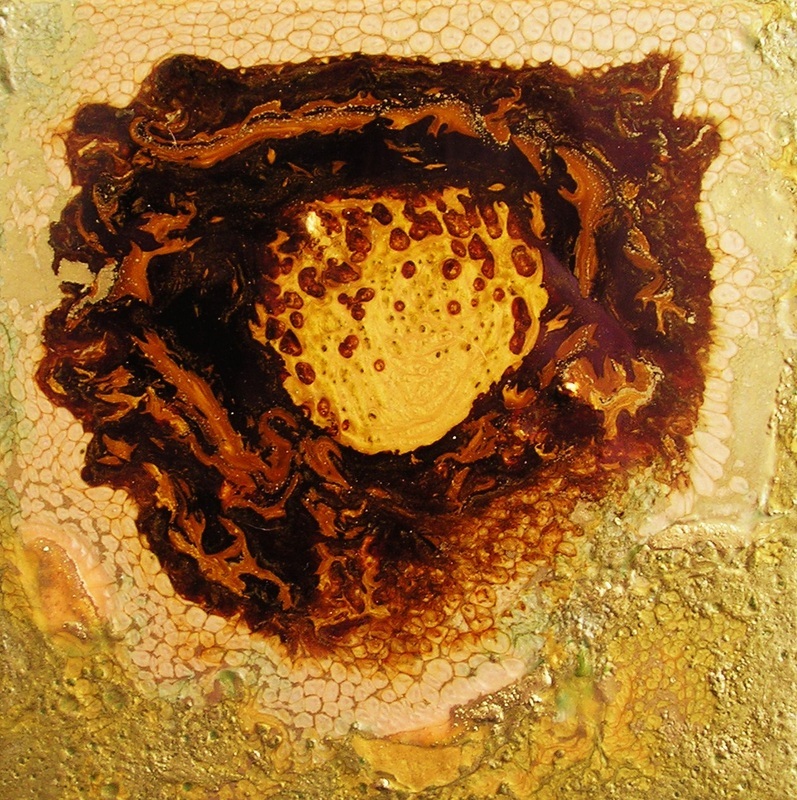 The gold reflecting the highlights of the sun against the many shades of brown... GOLDEN FALL is an abstract mixed media snapshot painted with mixed media paints on a 6"x6" Gessobord panel. 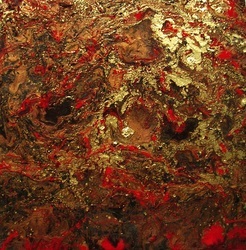 The classic RED ROSE is one of the themes in my abstract paintings with gold highlighting the majesty of this rose... 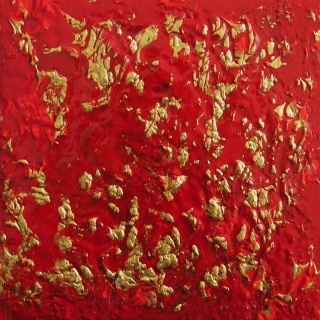 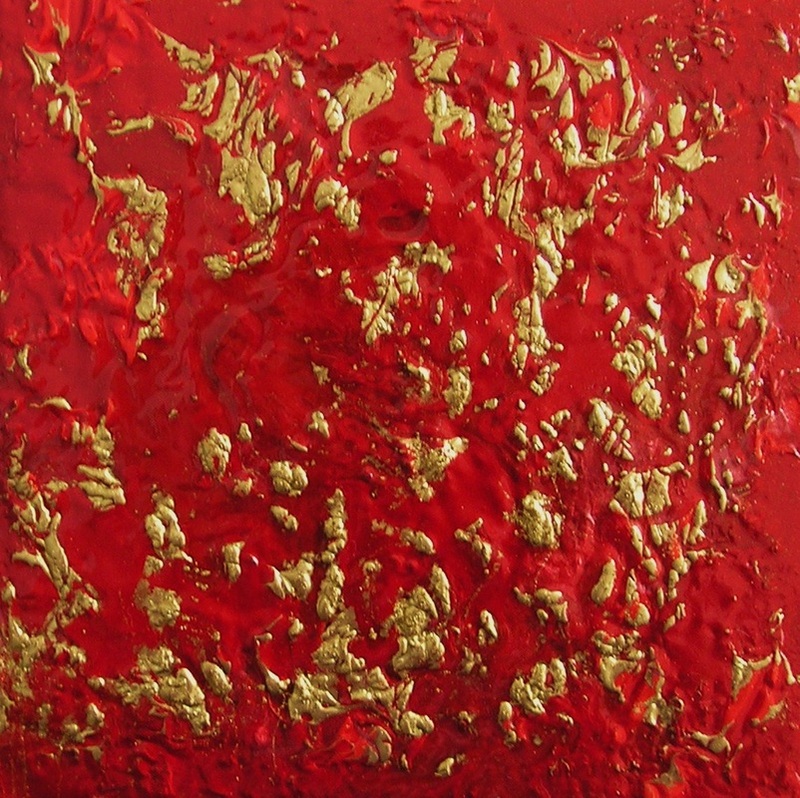 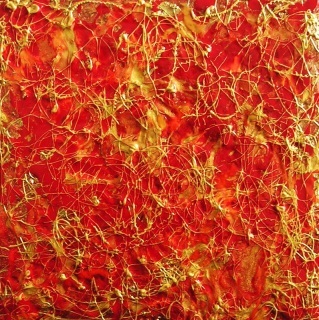 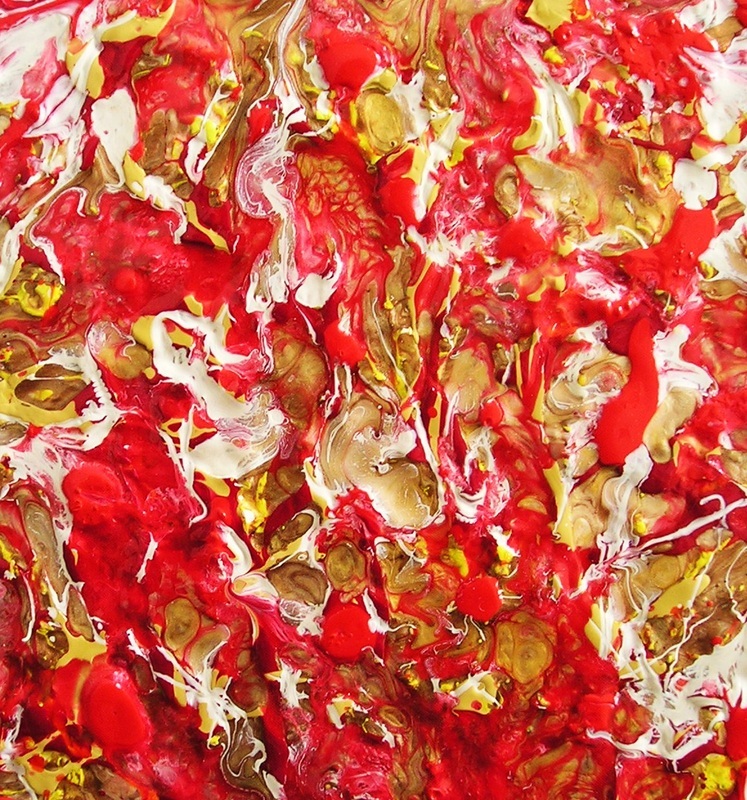 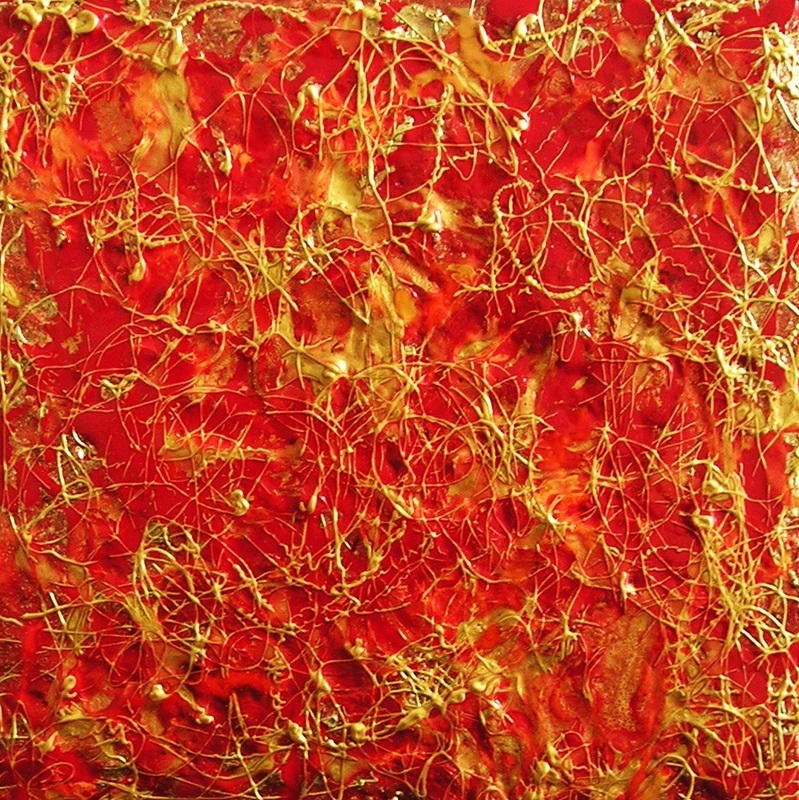 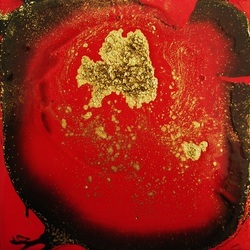 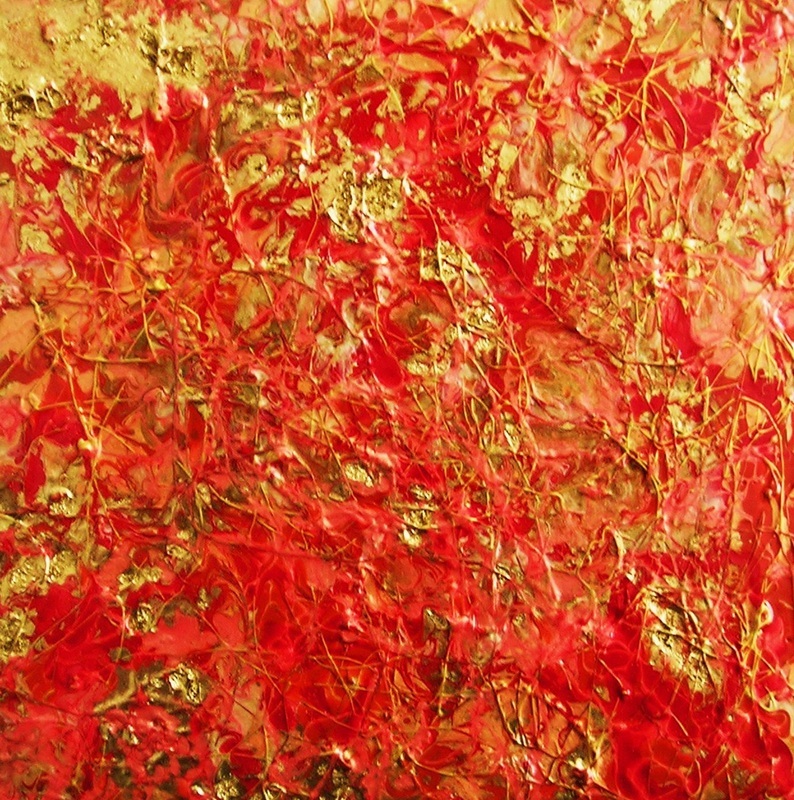 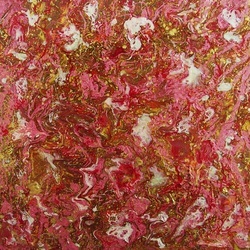 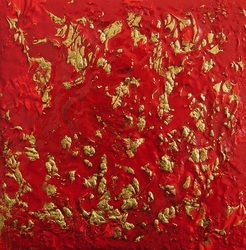 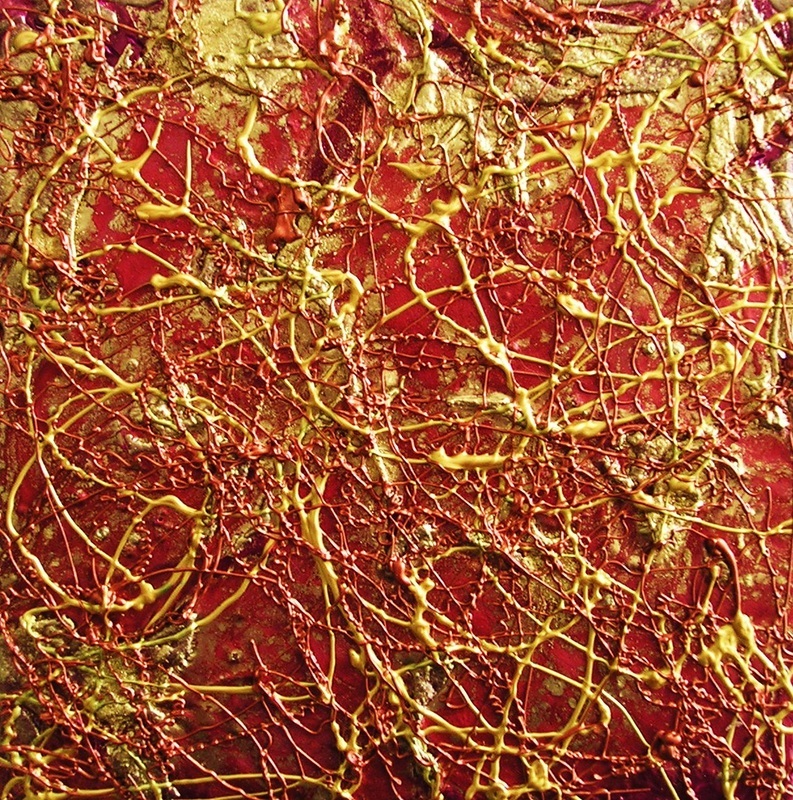 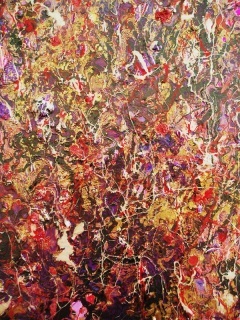 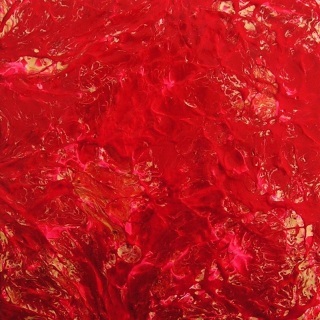 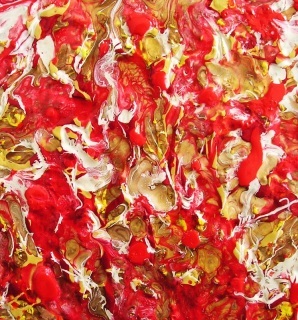 It is a regal combination of the brilliant red against the shining gold that brings this abstraction to life. 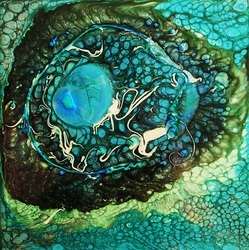 This painting is painted on a 6" x 6" Gessobord panel with mixed media paints. 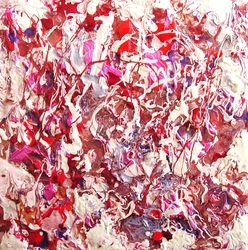 Summer months spent with my grand-mother in Ohio were filled with her hanging red geranium white baskets... 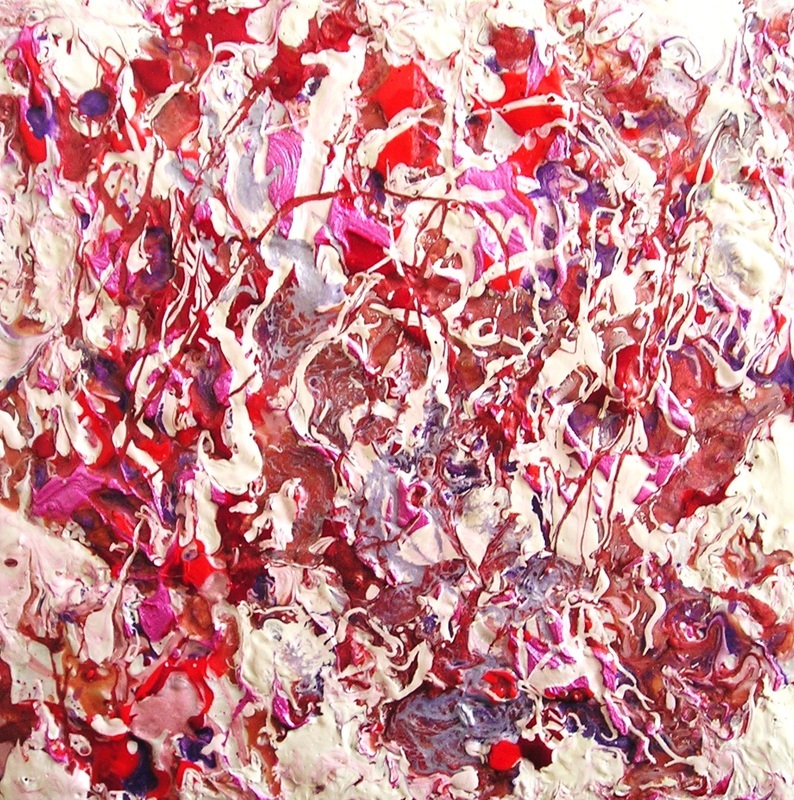 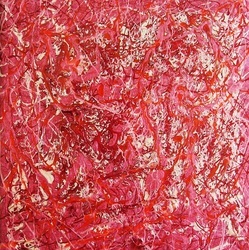 The brilliant reds against the white inspired me on this day with this painting titled: GERANIUM GARDEN. It is painted with acrylics and mixed media paints on a 6"x6" Gessobord panel. 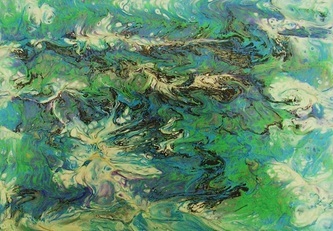 The weeping willow tree has been one of my favorite trees in terms of the grace and beauty it bestows upon nature. 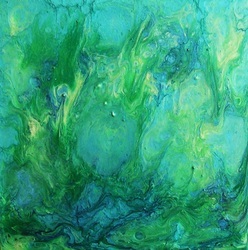 It is a tree with Presence that softly weeps in repose and splendor. 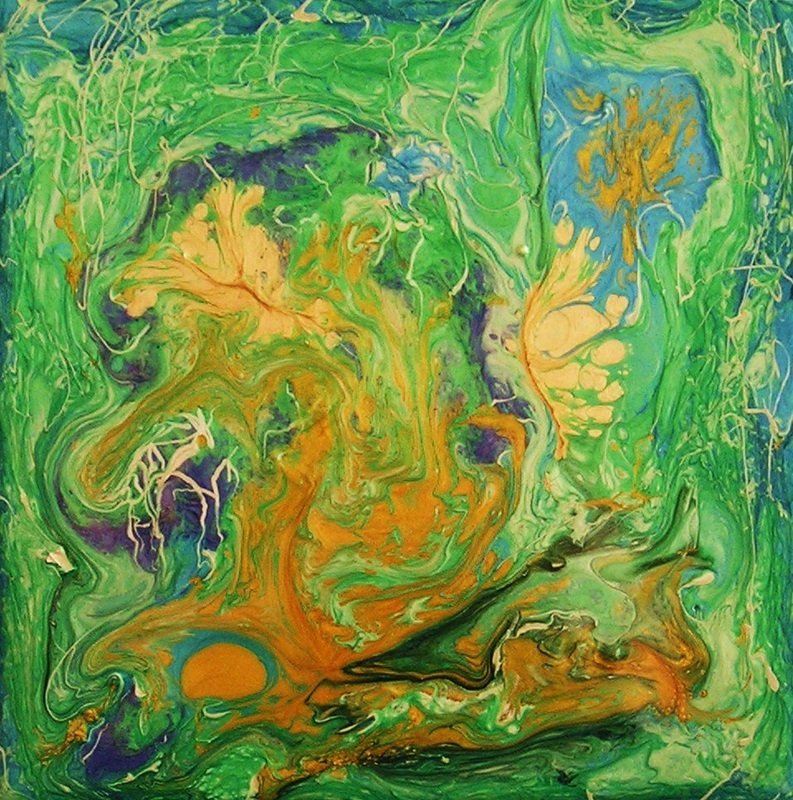 This painting is an abstract glimpse of the grace of this tree painted with mixed media paints on a 6" x6" Gessobord panel. 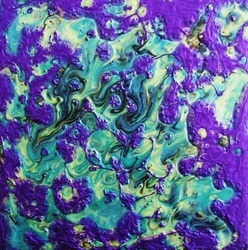 New original mixed media painting titled: "Purple Iris Garden" painted on Aquabord with mixed media and watercolor measuring 12" x 9". 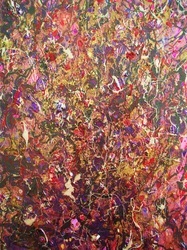 This painting is an abstract refraction of the various pinks, purples and reds with touches of gold leaf throughout capturing the splendor of an iris garden. 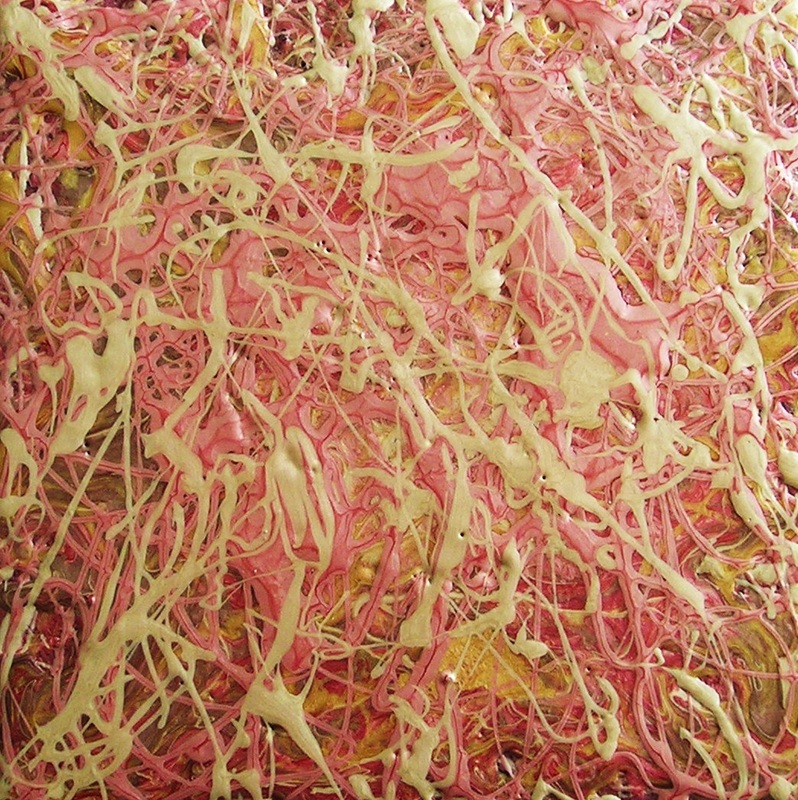 New mixed media painting titled "PINK ICE" measuring 7" x 5" on Gessobord with many layers of textures and paint highlighting various shades of pink. 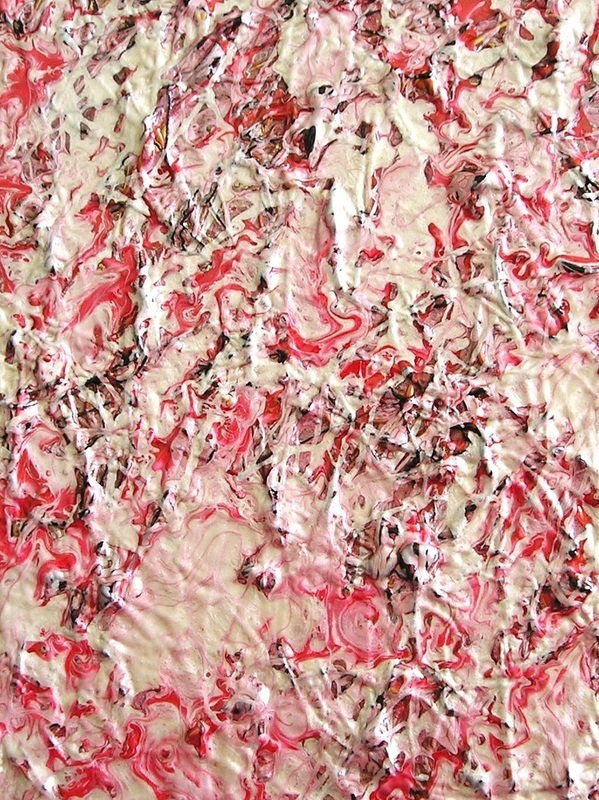 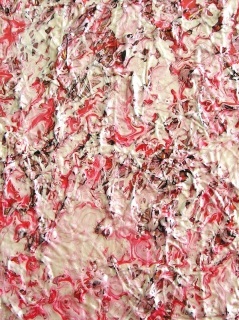 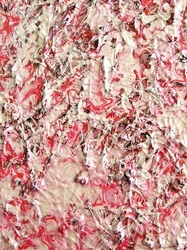 This painting reminds me of a candy cane, cotton candy and/ or pink snow (ice). 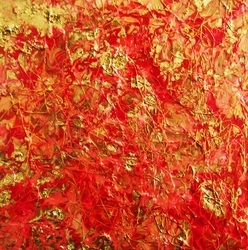 The fall colors splendid to gaze at... Here is an abstract view of these rich hues of red, orange and gold in a mixed media painting measuring 5"x7" on Gessobord. 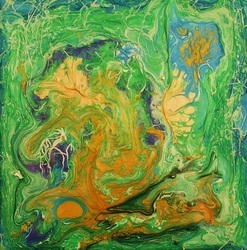 Take time to stop and soak in the seasons of nature... Painting is a snapshot of this Present moment.